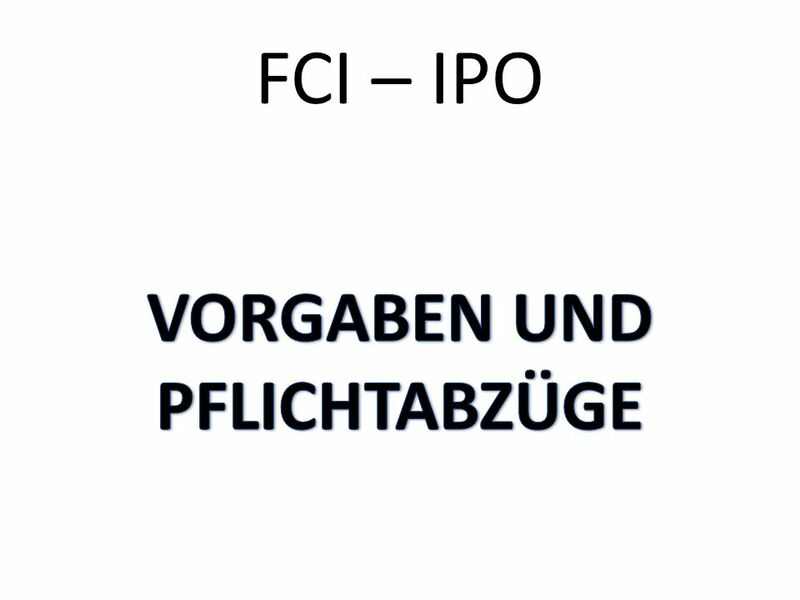 FCI – IPO. FCI-IPO Demands and obligated deductions. 3 ALGEMEIN IDENTITÄT: Identität der Hundes nicht eindeutig feststellbar: KEINE PRÜFUNGSZULASSUNG. 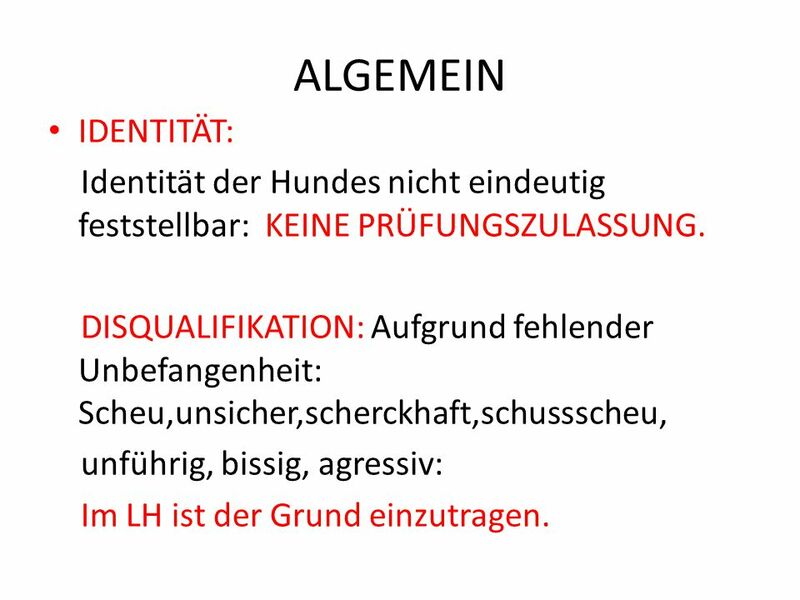 DISQUALIFIKATION: Aufgrund fehlender Unbefangenheit: Scheu,unsicher,scherckhaft,schussscheu, unführig, bissig, agressiv: Im LH ist der Grund einzutragen. 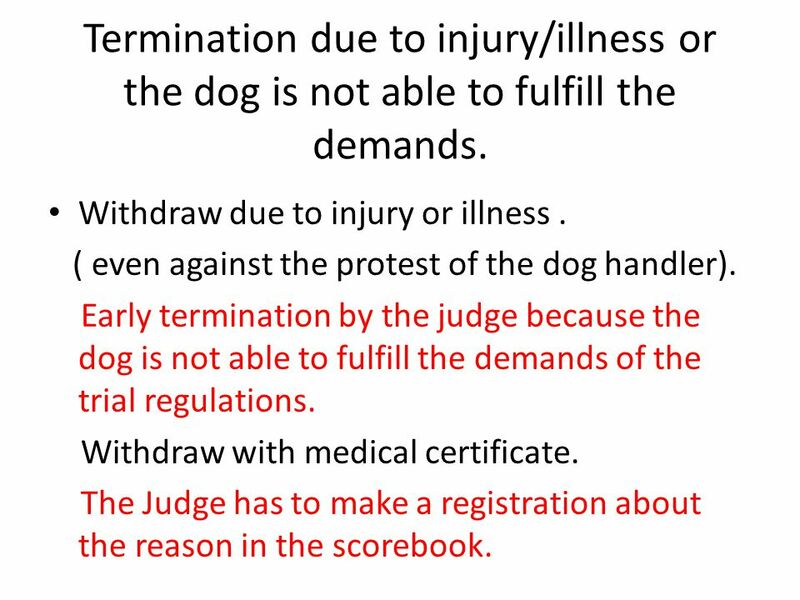 8 Termination due to injury/illness or the dog is not able to fulfill the demands. Withdraw due to injury or illness. ( even against the protest of the dog handler). 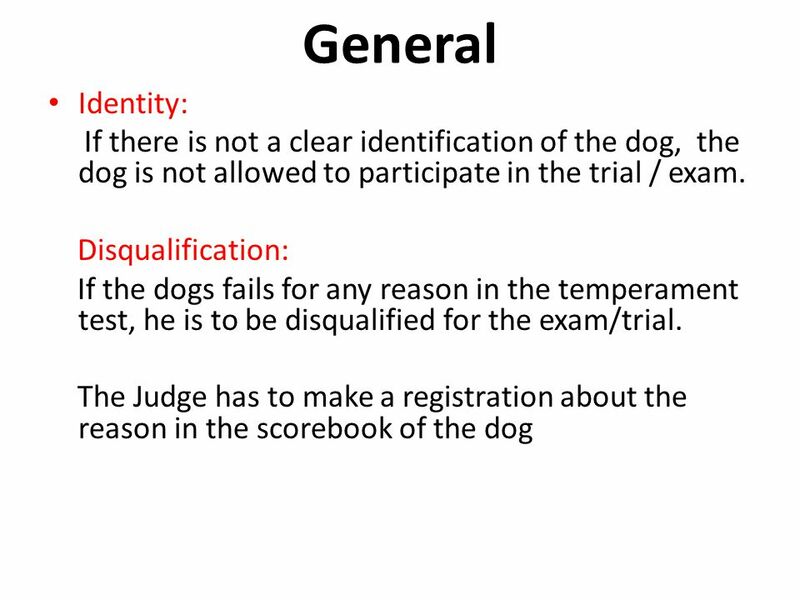 Early termination by the judge because the dog is not able to fulfill the demands of the trial regulations. Withdraw with medical certificate. The Judge has to make a registration about the reason in the scorebook. 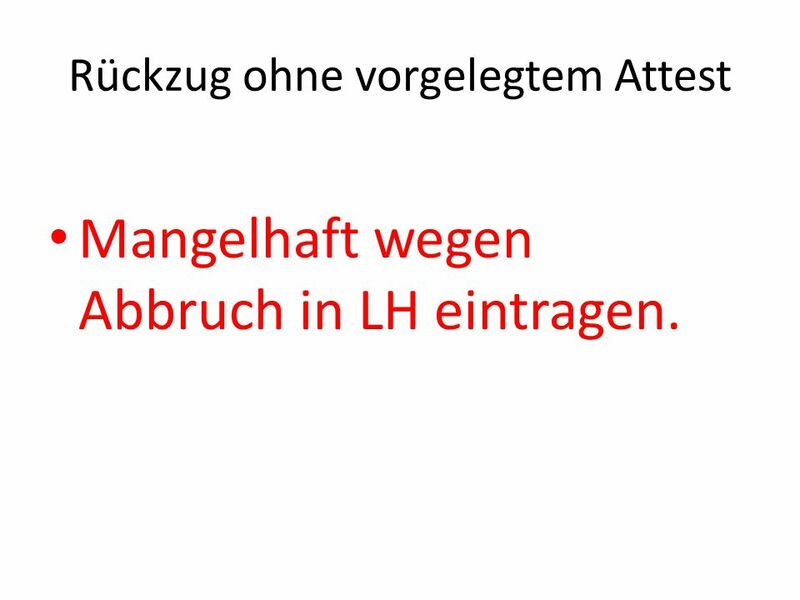 9 Rückzug ohne vorgelegtem Attest Mangelhaft wegen Abbruch in LH eintragen. 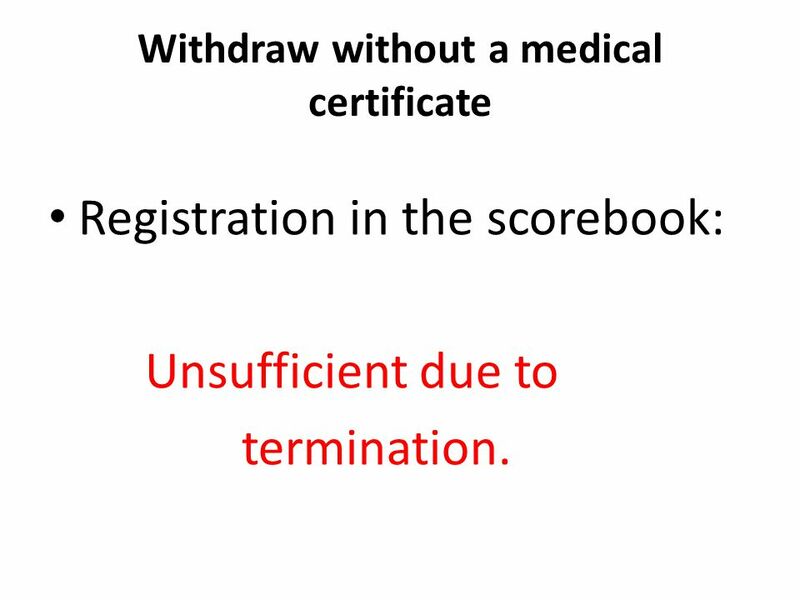 10 Withdraw without a medical certificate Registration in the scorebook: Unsufficient due to termination. 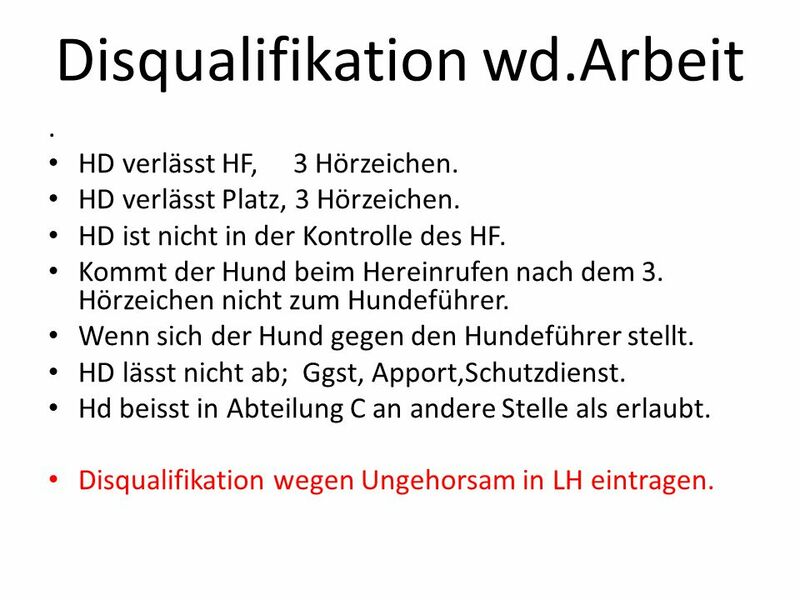 11 Disqualifikation wd.Arbeit. 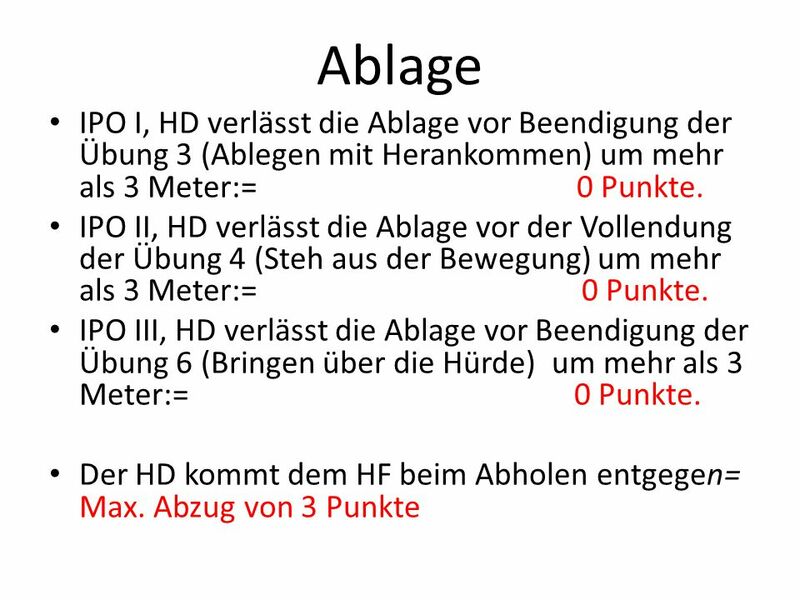 HD verlässt HF, 3 Hörzeichen. 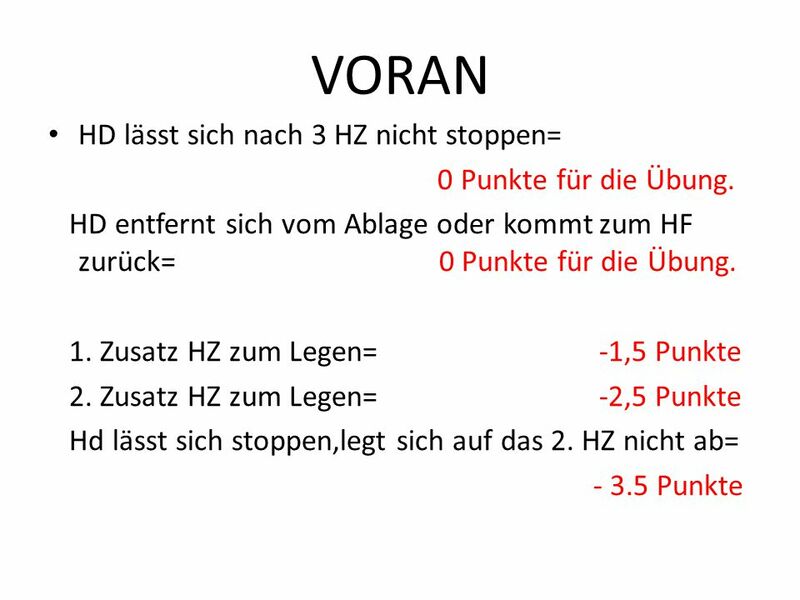 HD verlässt Platz, 3 Hörzeichen. 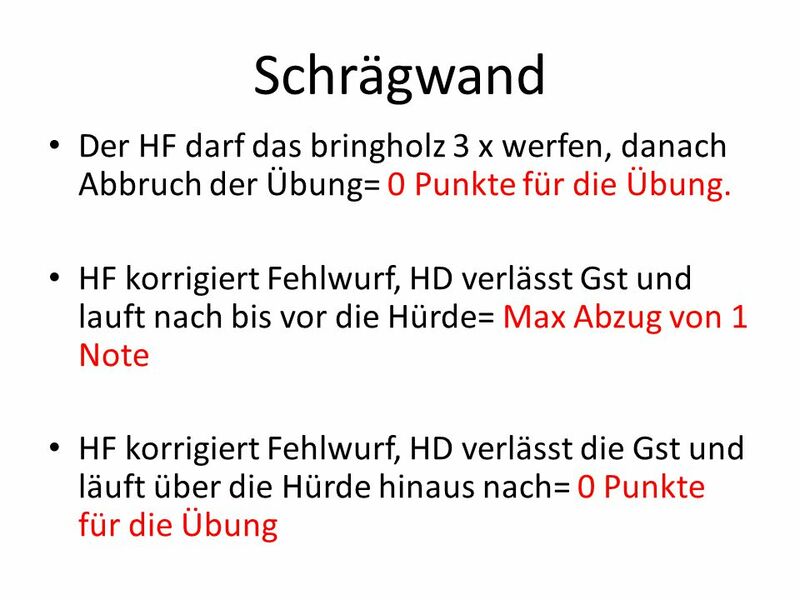 HD ist nicht in der Kontrolle des HF. Kommt der Hund beim Hereinrufen nach dem 3. Hörzeichen nicht zum Hundeführer. Wenn sich der Hund gegen den Hundeführer stellt. HD lässt nicht ab; Ggst, Apport,Schutzdienst. 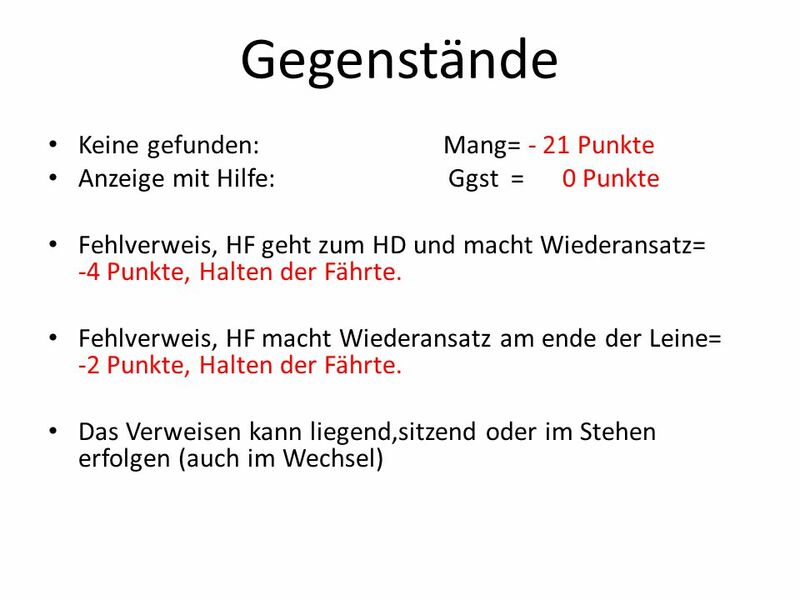 Hd beisst in Abteilung C an andere Stelle als erlaubt. 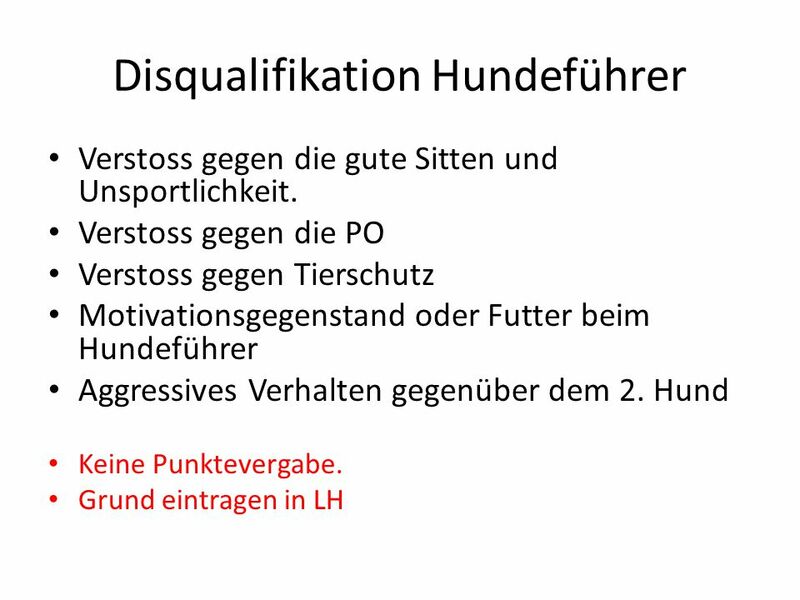 Disqualifikation wegen Ungehorsam in LH eintragen. 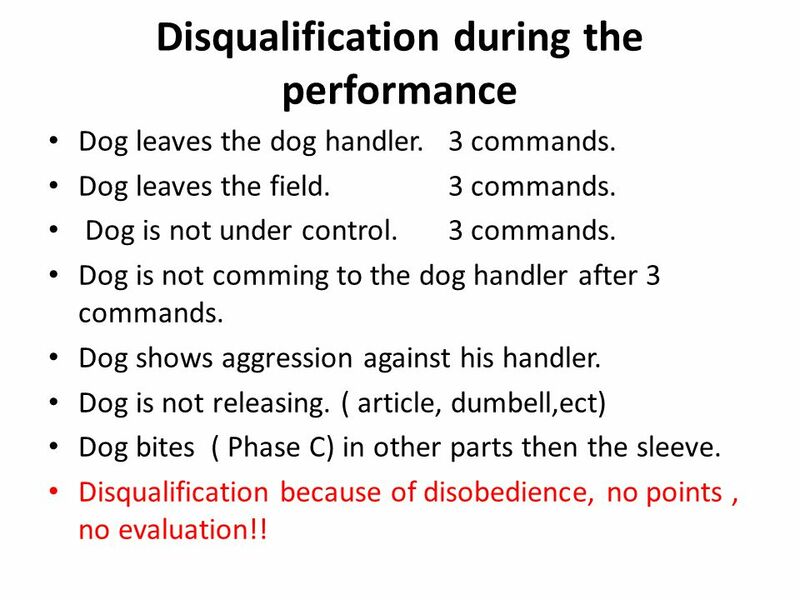 12 Disqualification during the performance Dog leaves the dog handler.3 commands. Dog leaves the field. 3 commands. Dog is not under control.3 commands. 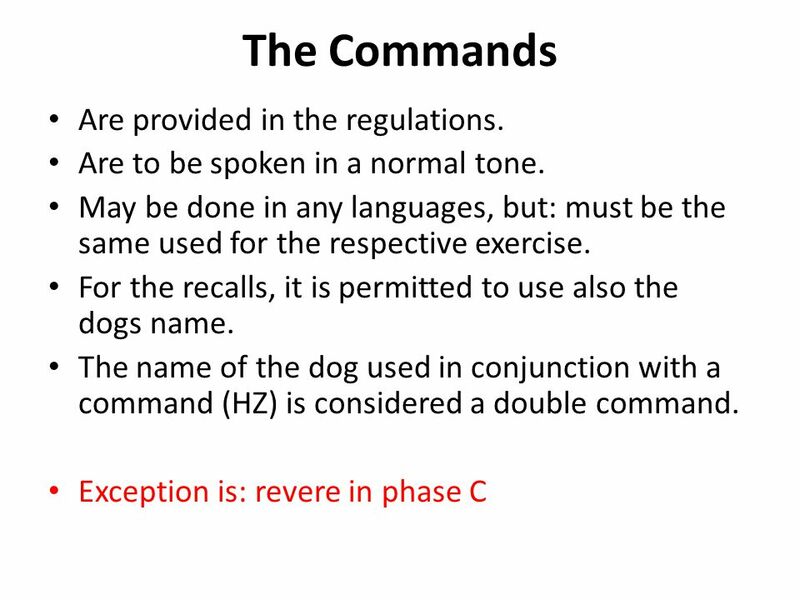 Dog is not comming to the dog handler after 3 commands. Dog shows aggression against his handler. Dog is not releasing. ( article, dumbell,ect) Dog bites ( Phase C) in other parts then the sleeve. Disqualification because of disobedience, no points, no evaluation!! 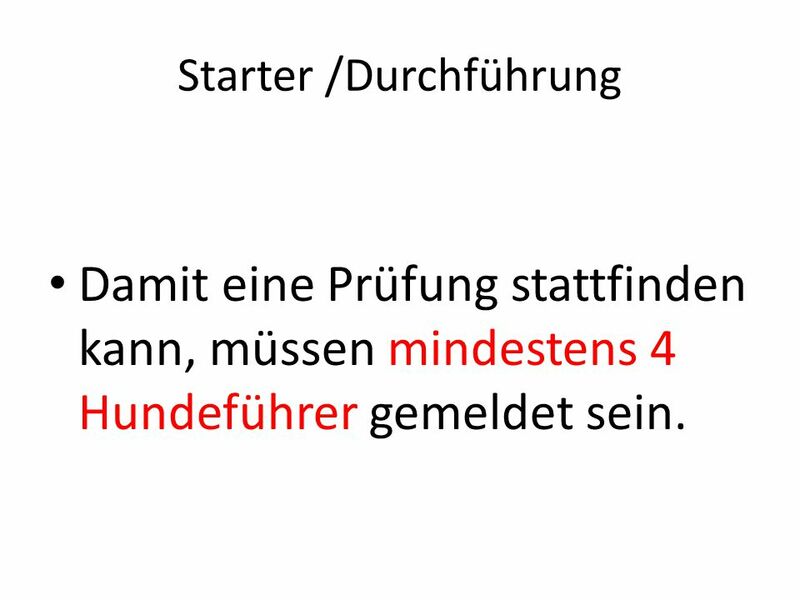 15 Starter /Durchführung Damit eine Prüfung stattfinden kann, müssen mindestens 4 Hundeführer gemeldet sein. 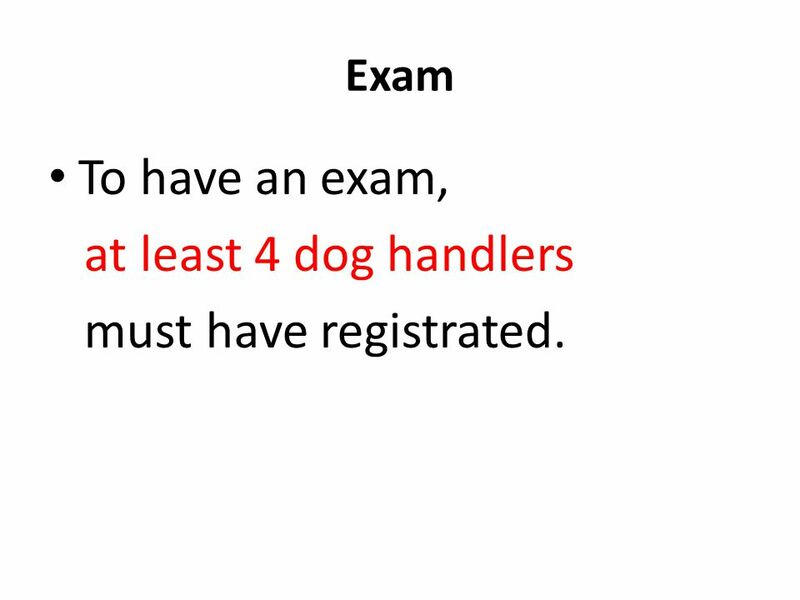 16 Exam To have an exam, at least 4 dog handlers must have registrated. 17 Anmelden beim LR IPO I mit Leine. 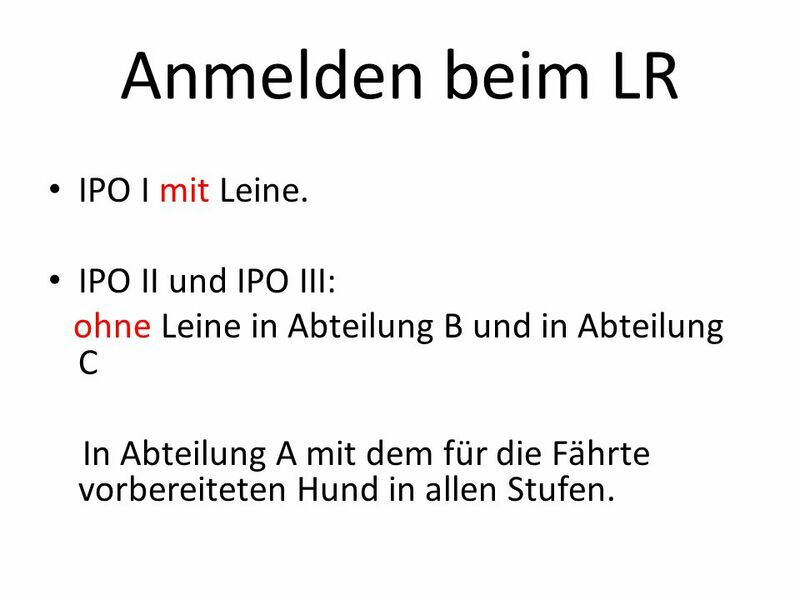 IPO II und IPO III: ohne Leine in Abteilung B und in Abteilung C In Abteilung A mit dem für die Fährte vorbereiteten Hund in allen Stufen. 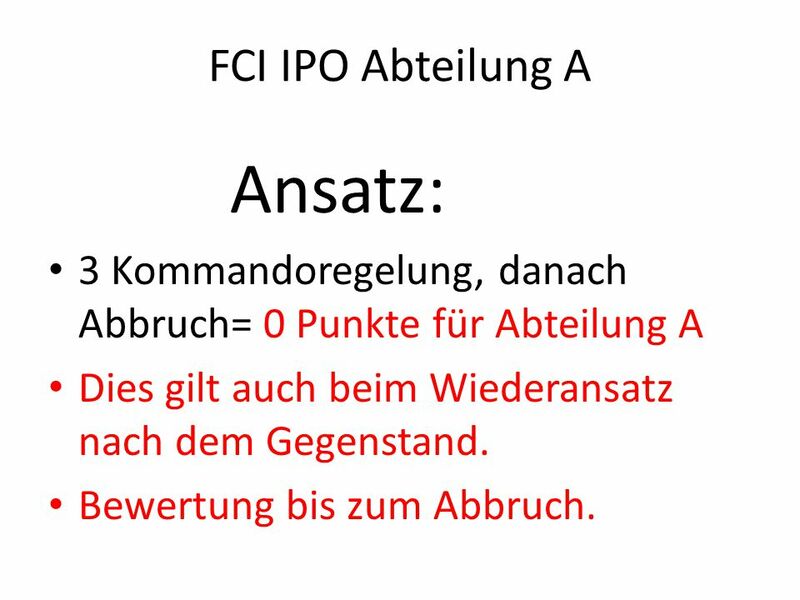 19 FCI IPO Abteilung A Ansatz: 3 Kommandoregelung, danach Abbruch= 0 Punkte für Abteilung A Dies gilt auch beim Wiederansatz nach dem Gegenstand. Bewertung bis zum Abbruch. 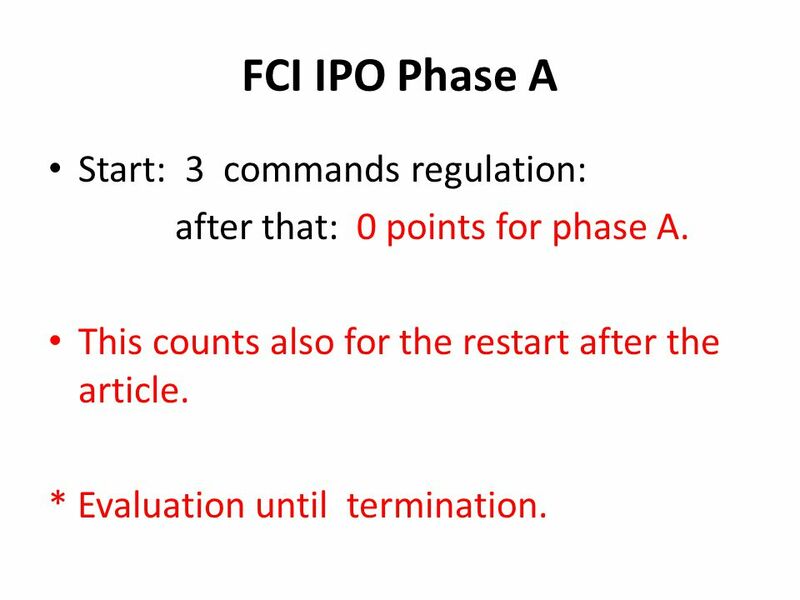 20 FCI IPO Phase A Start: 3 commands regulation: after that: 0 points for phase A. This counts also for the restart after the article. * Evaluation until termination. 22 Articles None found:Unsufficient= -21 points. Indicated with help: article= 0 points. Faulty indication, dog handler goes to the dog and makes his restart there= - 4points. Faulty indication, dog handler makes the restart at the end of the leash= - 2 points. The indication may be done either lying down, sitting or standing (also alternating is permitted). 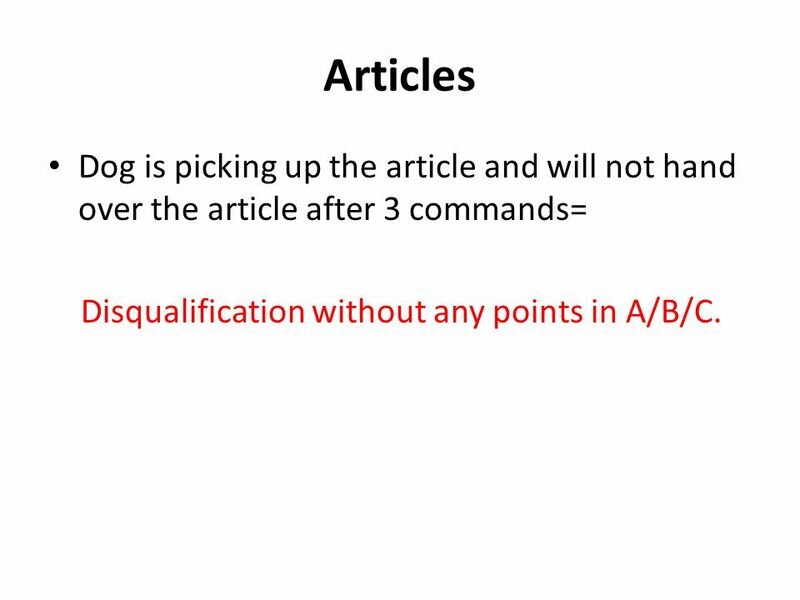 24 Articles Dog is picking up the article and will not hand over the article after 3 commands= Disqualification without any points in A/B/C. 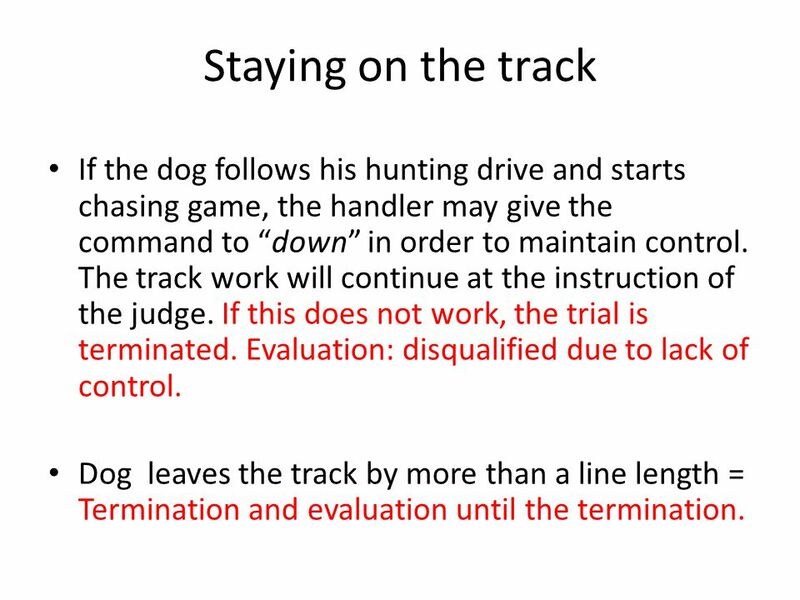 27 Staying on the track If the dog follows his hunting drive and starts chasing game, the handler may give the command to “down” in order to maintain control. The track work will continue at the instruction of the judge. If this does not work, the trial is terminated. Evaluation: disqualified due to lack of control. Dog leaves the track by more than a line length = Termination and evaluation until the termination. 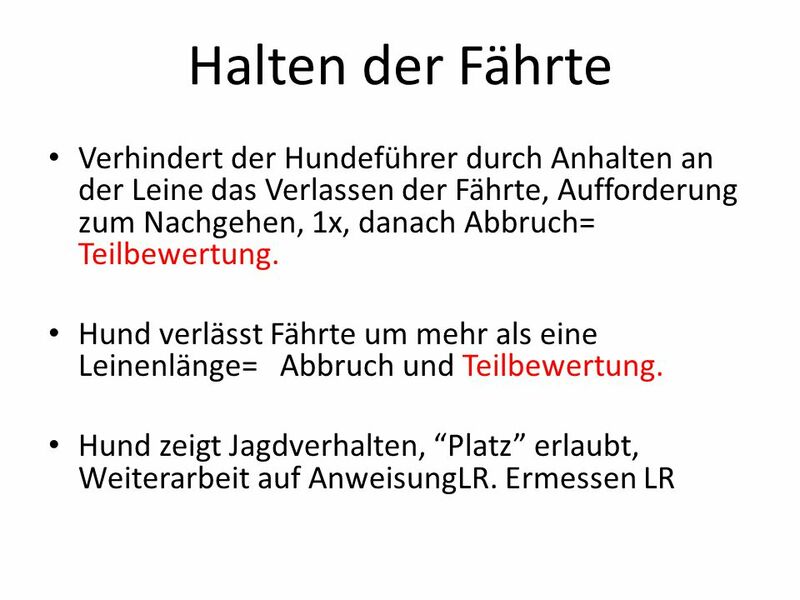 28 Ausarbeiten der Fährte Hund zeigt, Jagdverhalten, lässt sich nicht beruhigen, Hund nicht in der Hand des Führers= Disqualifikation ohne Punkte in A/B/C Abbruch im Fährtenverlauf, die bis zum Abbruch erbrachte Leistung muss bewertet werden. Zeitüberschreitung vor dem letzten Schenkel, Abbruch der Fährte. Die bis zum Abbruch erbrachte Leistung muss bewertet werden. 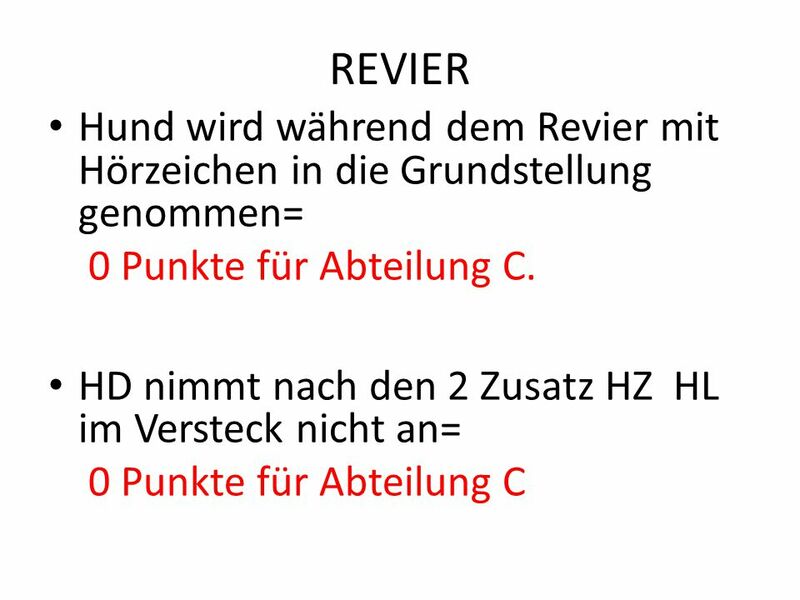 Ausgenommen IPO-FH 2 und IPO-FH. Hier wird bei Zeitüberschreitung nicht abgebrochen, wenn der Hund am letzten Schenkel ist. 29 Track performance If the track is terminated, there must be an evaluation until the termination. 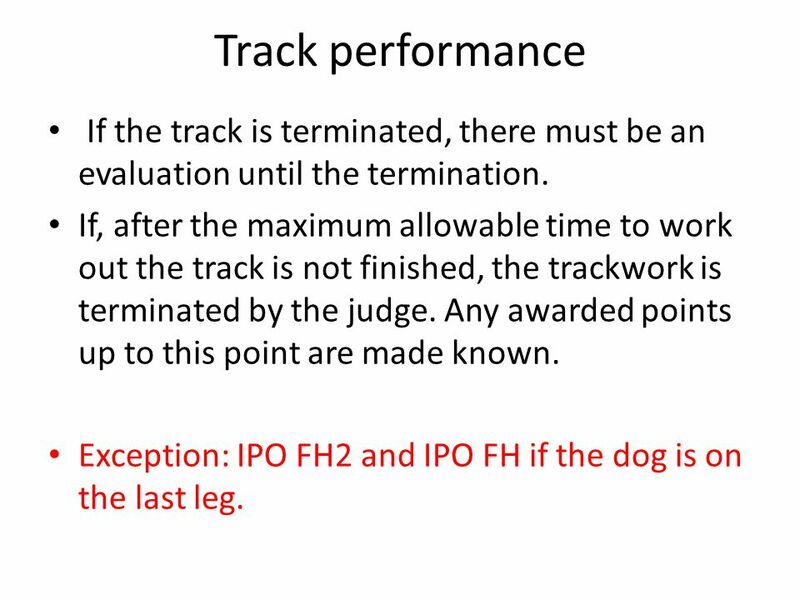 If, after the maximum allowable time to work out the track is not finished, the trackwork is terminated by the judge. Any awarded points up to this point are made known. 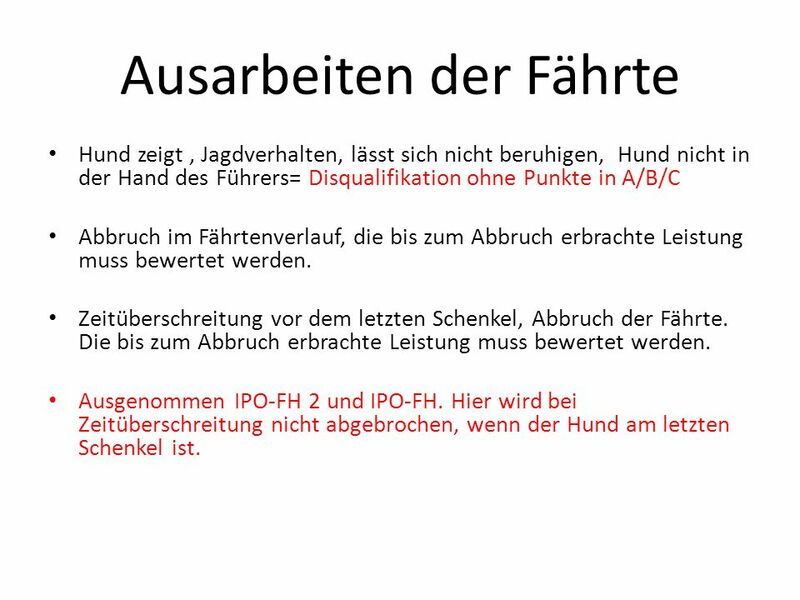 Exception: IPO FH2 and IPO FH if the dog is on the last leg. 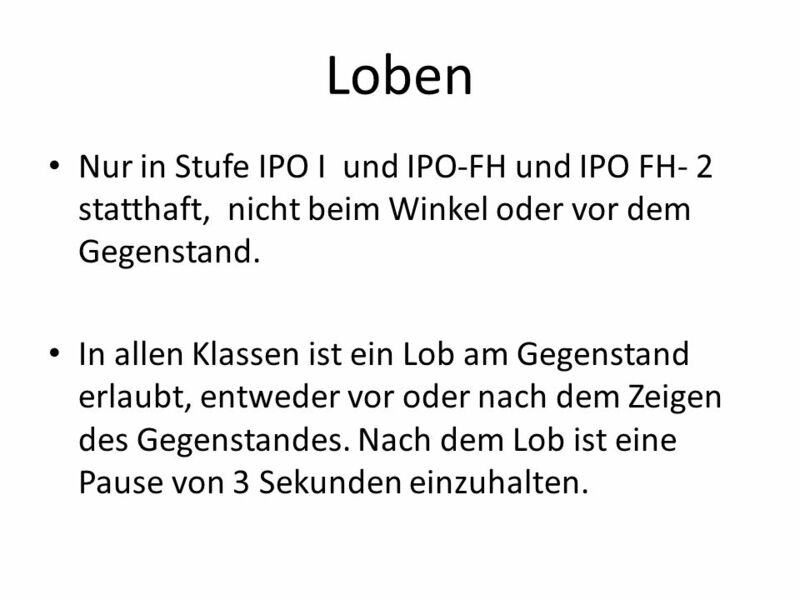 30 Loben Nur in Stufe IPO I und IPO-FH und IPO FH- 2 statthaft, nicht beim Winkel oder vor dem Gegenstand. In allen Klassen ist ein Lob am Gegenstand erlaubt, entweder vor oder nach dem Zeigen des Gegenstandes. Nach dem Lob ist eine Pause von 3 Sekunden einzuhalten. 31 Praising the dog The dog may be praised at the articles. A short praise may be given either before or after the article is shown. 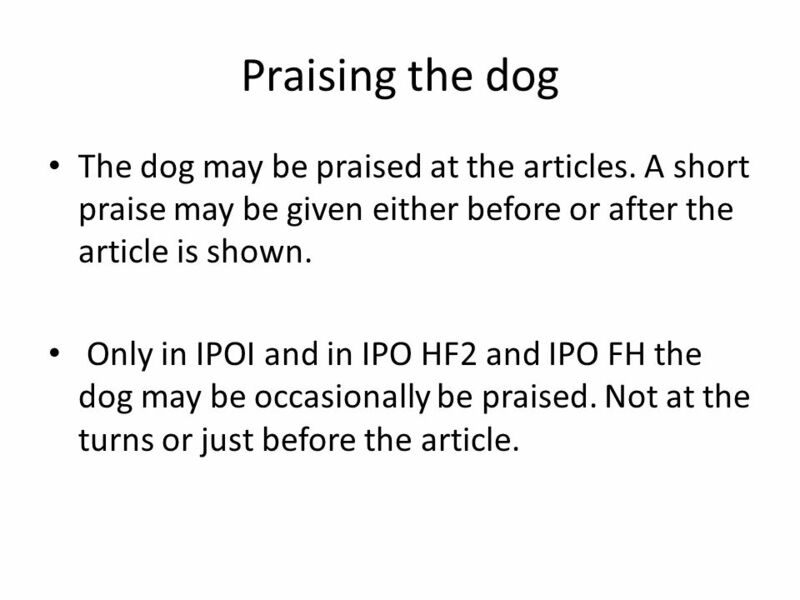 Only in IPOI and in IPO HF2 and IPO FH the dog may be occasionally be praised. Not at the turns or just before the article. 32 FCI - IPO Abteilung B ALGEMEIN: Die Grundstellung darf für jede Übung 1x in der Vorwärtsbewegung eingenommen werden. 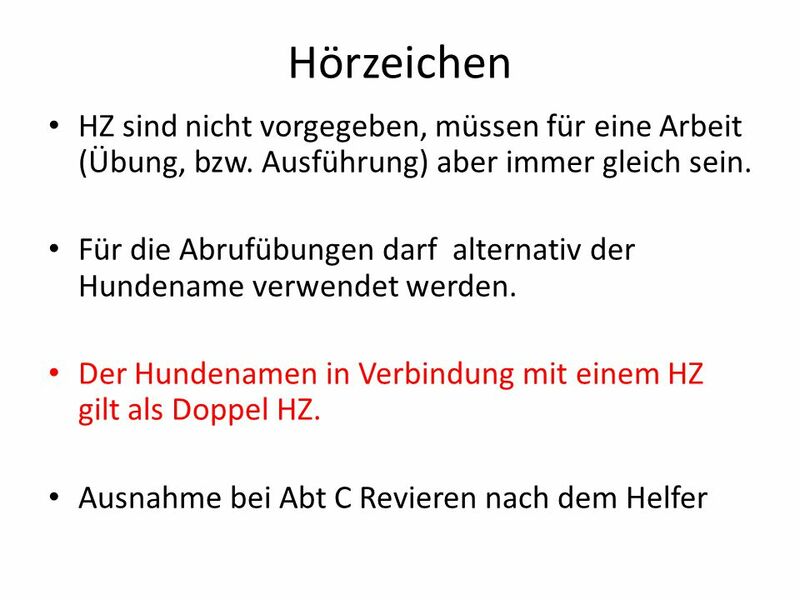 Die Kehrwendung ist innerhalb der Abt.immer gleich zu zeigen (entweder vorne oder hinter dem HF), aus dem Vorsitz sind beide Abschlussvarianten erlaubt, müssen aber immer gleich gezeigt werden. 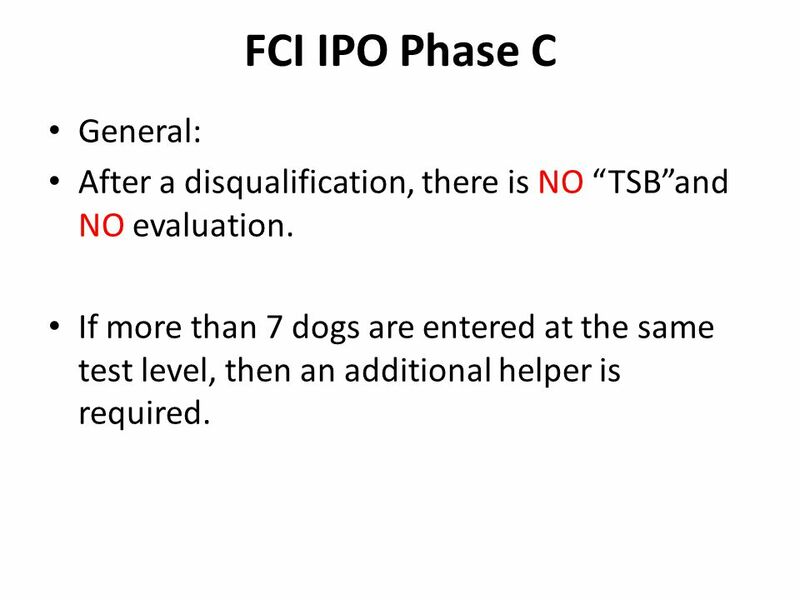 33 FCI-IPO Phase B General: For all exercises, the basic position is only allowed once in the forward way. The handler (HF) has to demonstrate the about turn to the left. 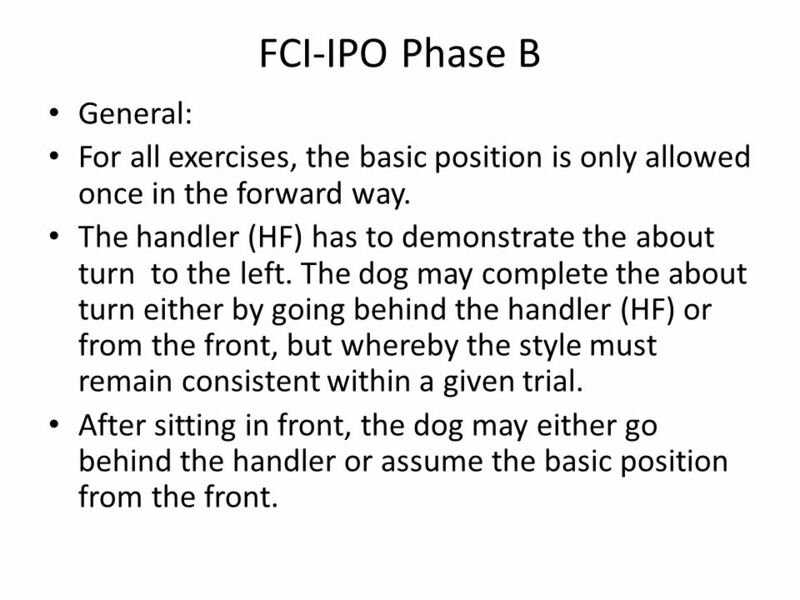 The dog may complete the about turn either by going behind the handler (HF) or from the front, but whereby the style must remain consistent within a given trial. After sitting in front, the dog may either go behind the handler or assume the basic position from the front. 34 ALGEMEIN Als aufgeteilte Übungen gelten das Platz und Steh aus der Bewegung: 5P/5P. Beurteilungskriterien sind der Sinn und Zweck der Übung. Führt ein Hund nach dem 3. 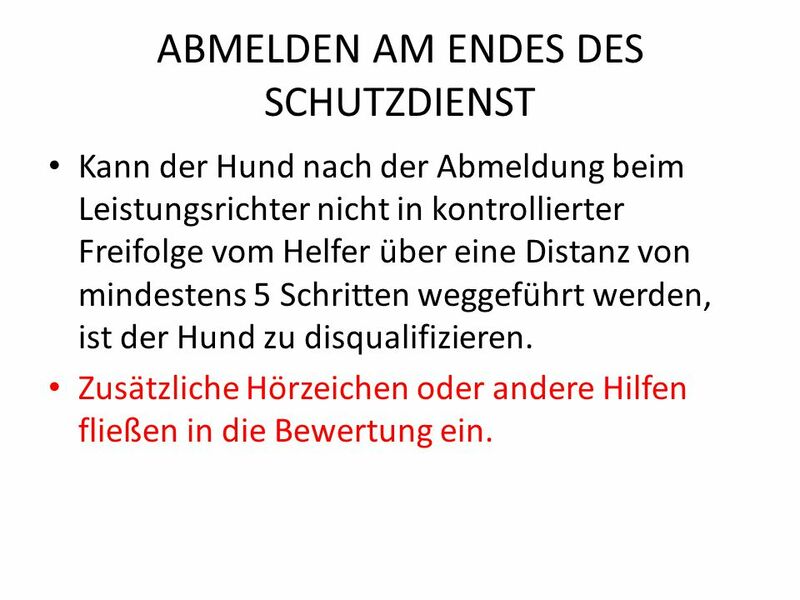 Hörzeichen die Übung nicht aus und folgt dem Hundeführer, ist die Übung mit 0 Punkten zu bewerten. Stellungsfehler entwerten, ohne Berücksichtigung anderer Fehler, die Übung um eine Pflichtentwertung von 5 Punkten. Führt ein Hund aus dem Vorsitz die Abschlussgrundstellung nach dem 3. Hörzeichen nicht aus, so ist diese Übung maximal im höchsten mangelhaft zu bewerten. 35 General Divisible exercises are the “Down out of motion ”and “Stay out of motion” (5/5). Criteria for evaluation, are the sences and objects of the excersice. If the dog is not obedient to the 3. command and keeps following the dog handler: 0 points for the exercise. 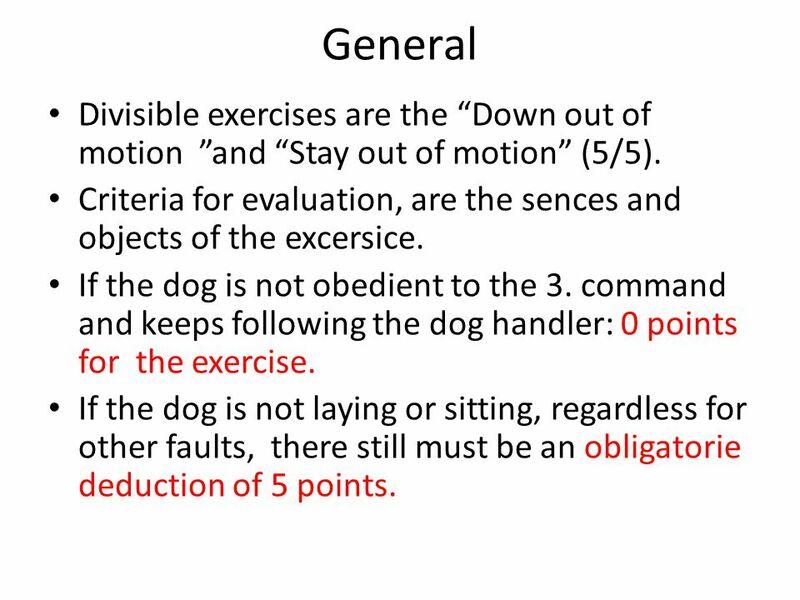 If the dog is not laying or sitting, regardless for other faults, there still must be an obligatorie deduction of 5 points. 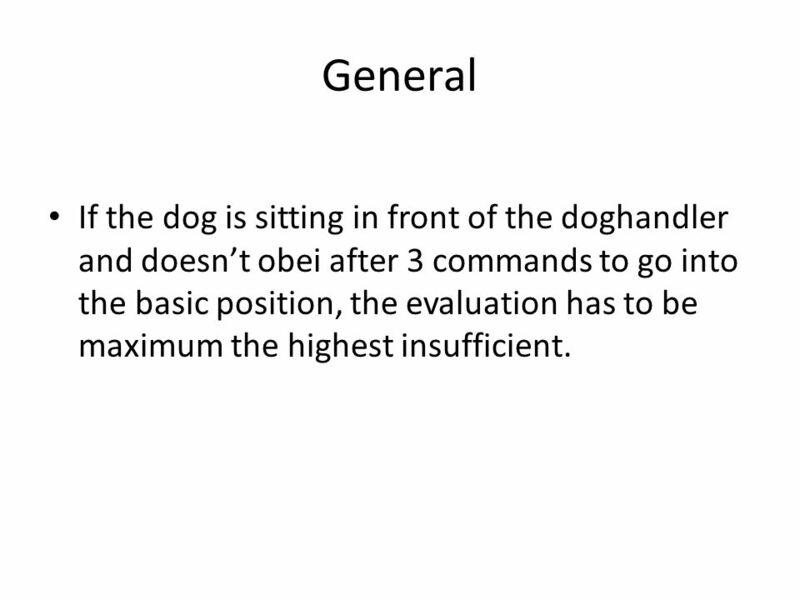 36 General If the dog is sitting in front of the doghandler and doesn’t obei after 3 commands to go into the basic position, the evaluation has to be maximum the highest insufficient. 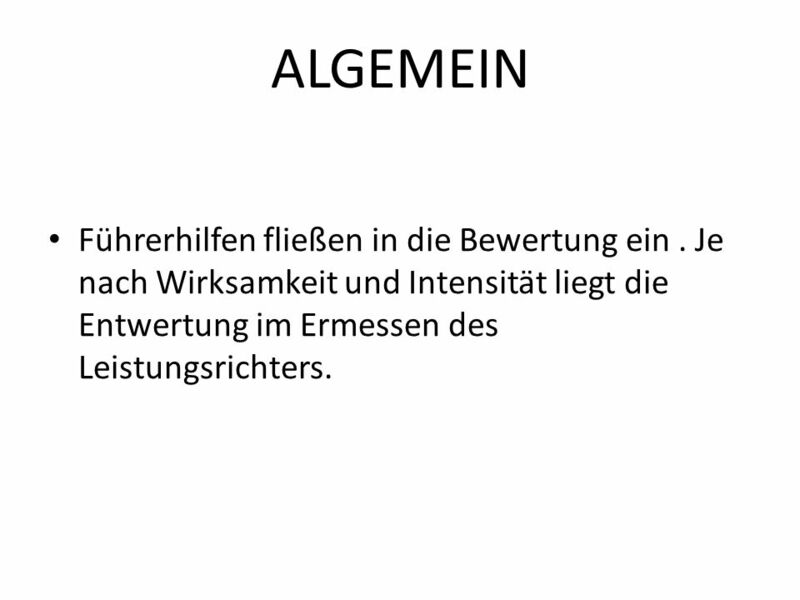 37 ALGEMEIN Führerhilfen fließen in die Bewertung ein. Je nach Wirksamkeit und Intensität liegt die Entwertung im Ermessen des Leistungsrichters. 38 General Dog handlers helps will deduct the evaluation of the excercise. The prescribed mandatory deductions in the trial rules are to be taken into consideration. 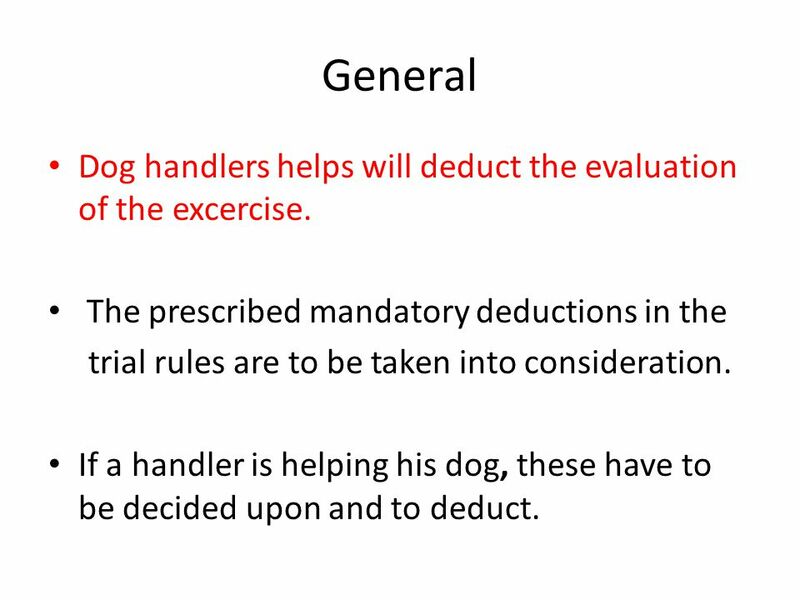 If a handler is helping his dog, these have to be decided upon and to deduct. 40 Retrieve Dog retrieves before the command.= maximum deduction of 2 qualifications ( also deduction of 1 qualif. is possible, it depends on the situation) * Attention: retrieve over the hurdle is 5 points! The deduction is to take from those 5 points. ( 10 points are for the correct jumps.) * Dog handler leaves the basic position before the dog is sitting in front of the dog handler. 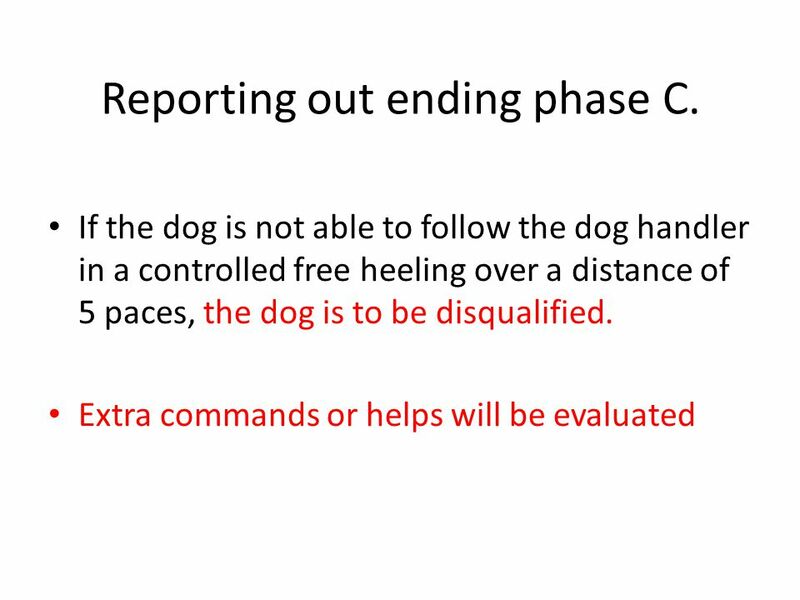 ( helps for the dog to come in the front position, coming back to the dog handler, for the jumps, ect) = it is up to the judge to decide the deduction. Possible to deduct up to 2 qualifications into insufficient. 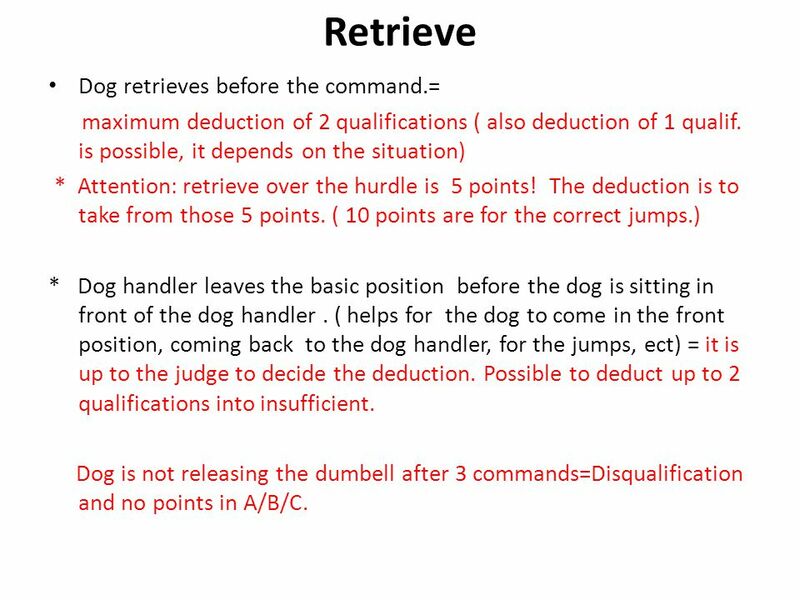 Dog is not releasing the dumbell after 3 commands=Disqualification and no points in A/B/C. 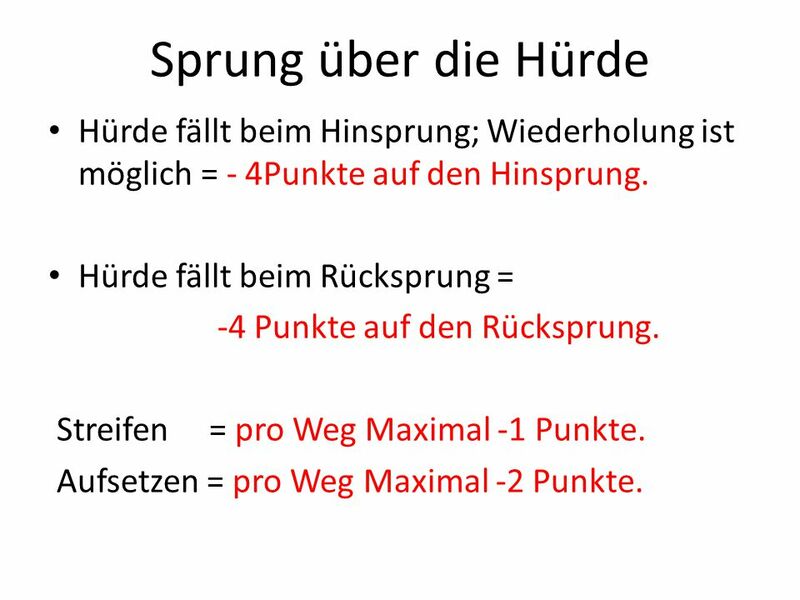 43 Sprung über die Hürde Hürde fällt beim Hinsprung; Wiederholung ist möglich = - 4Punkte auf den Hinsprung. Hürde fällt beim Rücksprung = -4 Punkte auf den Rücksprung. Streifen = pro Weg Maximal -1 Punkte. Aufsetzen = pro Weg Maximal -2 Punkte. 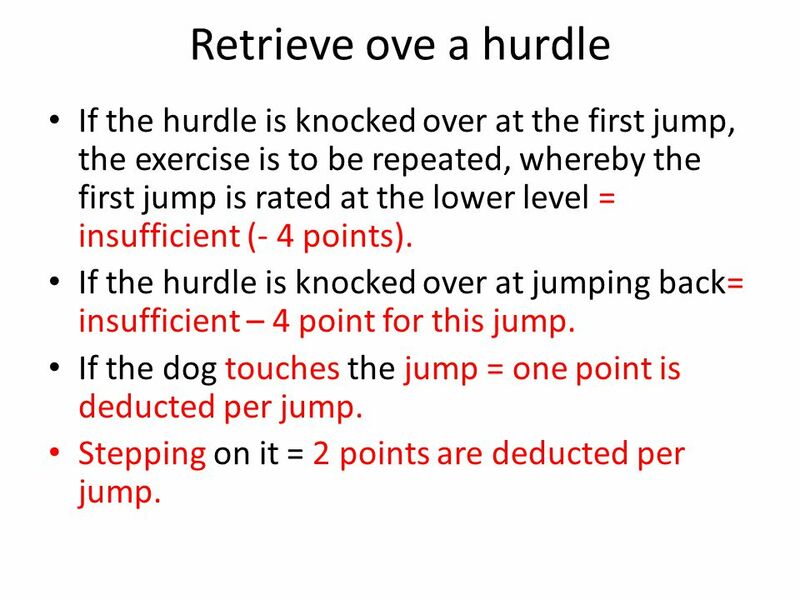 44 Retrieve ove a hurdle If the hurdle is knocked over at the first jump, the exercise is to be repeated, whereby the first jump is rated at the lower level = insufficient (- 4 points). If the hurdle is knocked over at jumping back= insufficient – 4 point for this jump. If the dog touches the jump = one point is deducted per jump. Stepping on it = 2 points are deducted per jump. 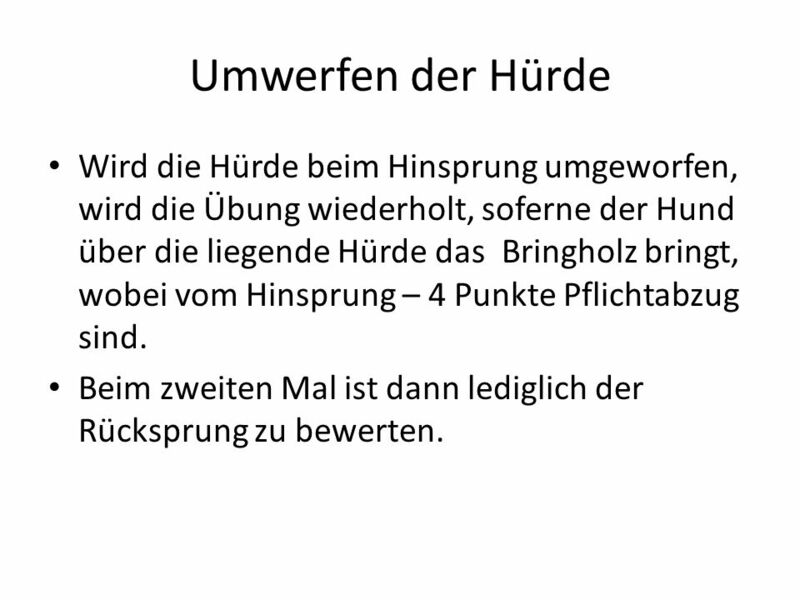 45 Umwerfen der Hürde Wird die Hürde beim Hinsprung umgeworfen, wird die Übung wiederholt, soferne der Hund über die liegende Hürde das Bringholz bringt, wobei vom Hinsprung – 4 Punkte Pflichtabzug sind. Beim zweiten Mal ist dann lediglich der Rücksprung zu bewerten. 46 Knocking down the hurdle If the hurdle is knocked down, the excercise is to be repate. 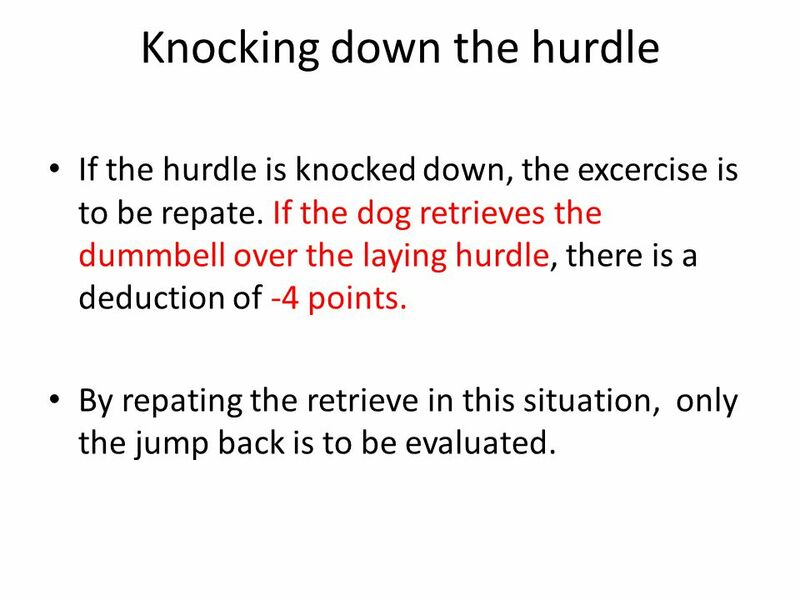 If the dog retrieves the dummbell over the laying hurdle, there is a deduction of -4 points. By repating the retrieve in this situation, only the jump back is to be evaluated. 48 . 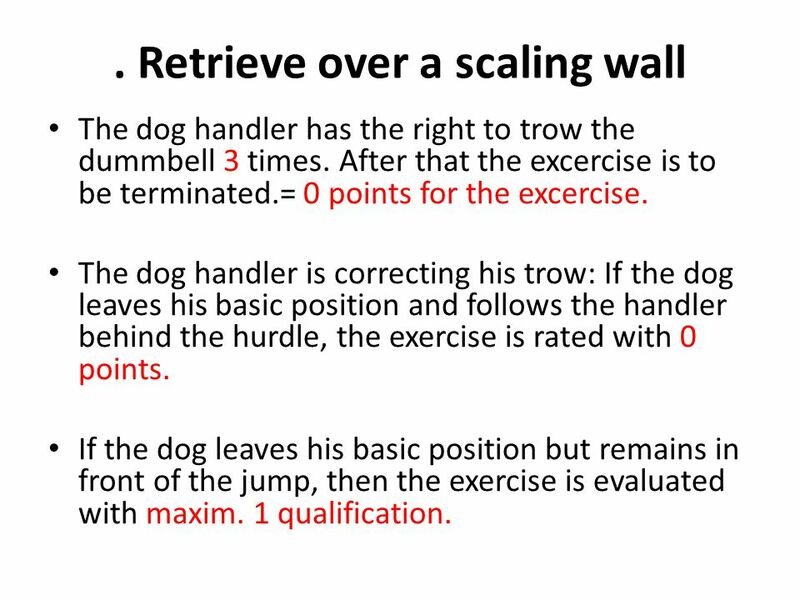 Retrieve over a scaling wall The dog handler has the right to trow the dummbell 3 times. After that the excercise is to be terminated.= 0 points for the excercise. 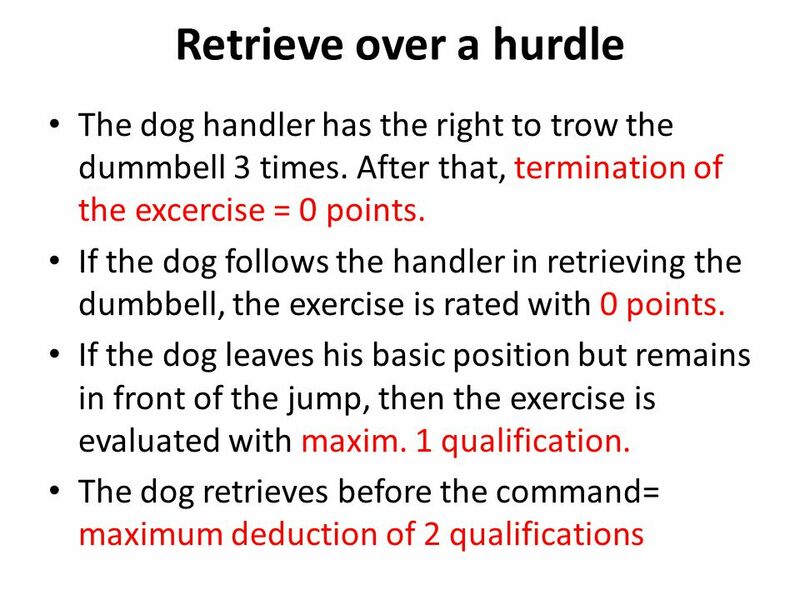 The dog handler is correcting his trow: If the dog leaves his basic position and follows the handler behind the hurdle, the exercise is rated with 0 points. If the dog leaves his basic position but remains in front of the jump, then the exercise is evaluated with maxim. 1 qualification. 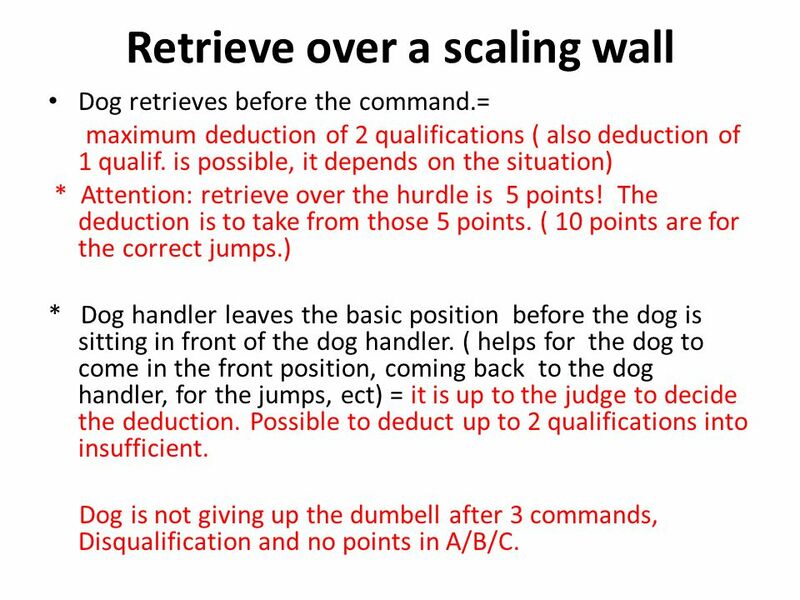 50 Retrieve over a scaling wall Dog retrieves before the command.= maximum deduction of 2 qualifications ( also deduction of 1 qualif. is possible, it depends on the situation) * Attention: retrieve over the hurdle is 5 points! The deduction is to take from those 5 points. ( 10 points are for the correct jumps.) * Dog handler leaves the basic position before the dog is sitting in front of the dog handler. 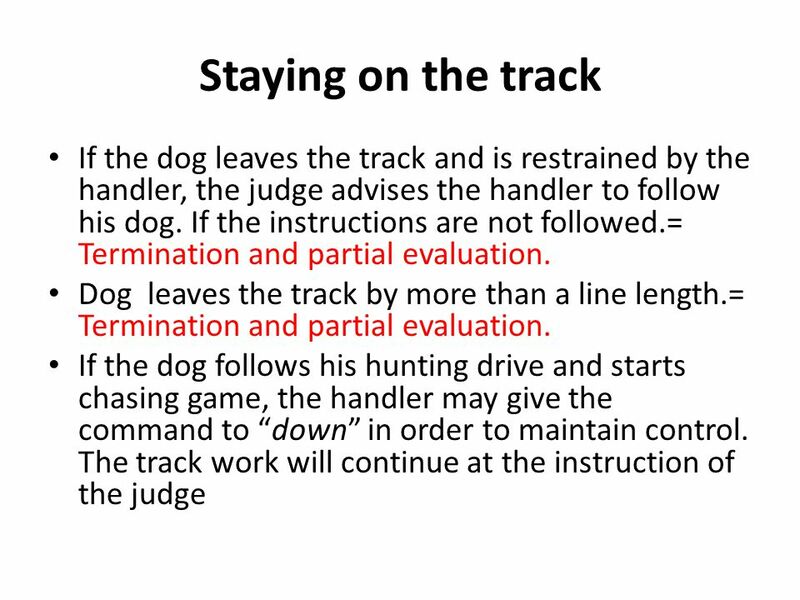 ( helps for the dog to come in the front position, coming back to the dog handler, for the jumps, ect) = it is up to the judge to decide the deduction. Possible to deduct up to 2 qualifications into insufficient. Dog is not giving up the dumbell after 3 commands, Disqualification and no points in A/B/C. 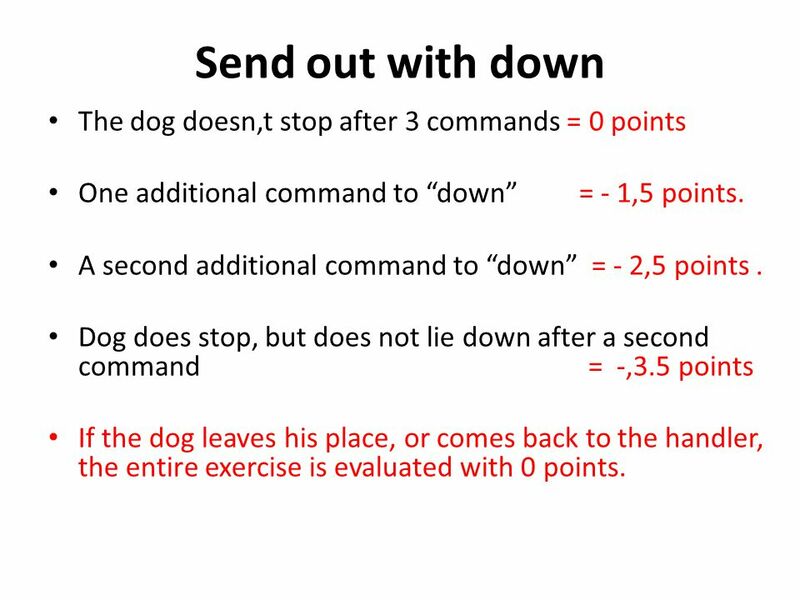 52 Send out with down The dog doesn,t stop after 3 commands = 0 points One additional command to “down” = - 1,5 points. A second additional command to “down” = - 2,5 points. 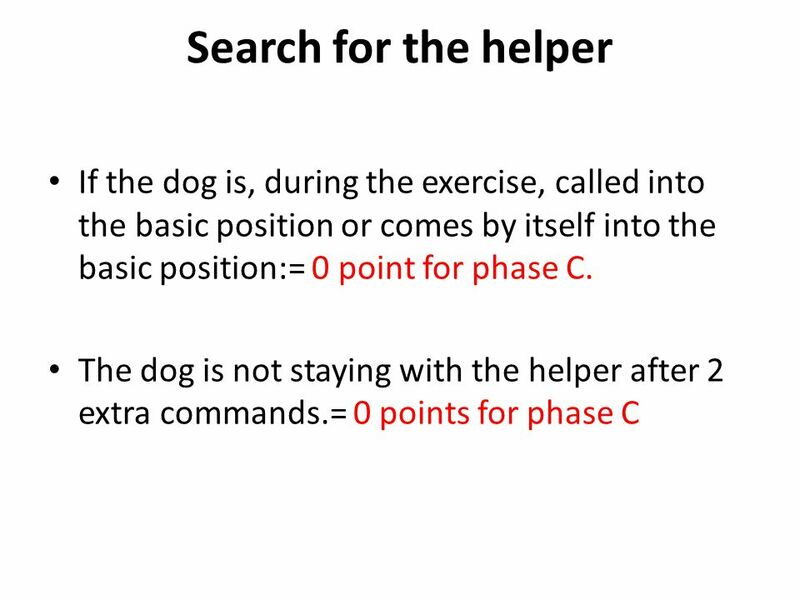 Dog does stop, but does not lie down after a second command = -,3.5 points If the dog leaves his place, or comes back to the handler, the entire exercise is evaluated with 0 points. 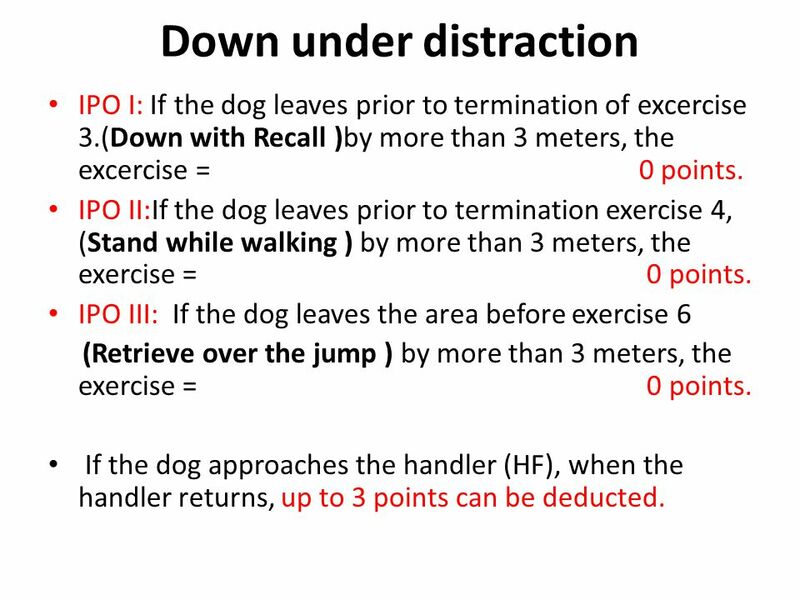 54 Down under distraction IPO I: If the dog leaves prior to termination of excercise 3. (Down with Recall )by more than 3 meters, the excercise = 0 points. 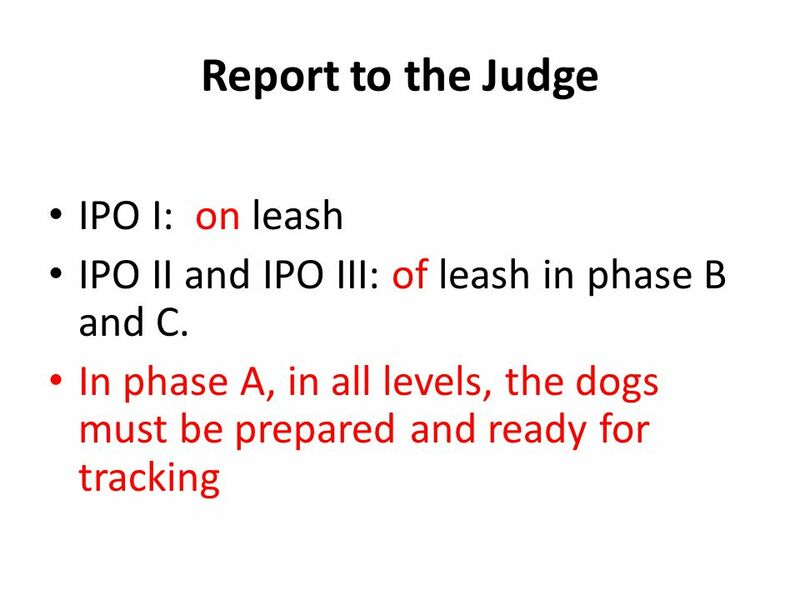 IPO II:If the dog leaves prior to termination exercise 4, (Stand while walking ) by more than 3 meters, the exercise = 0 points. 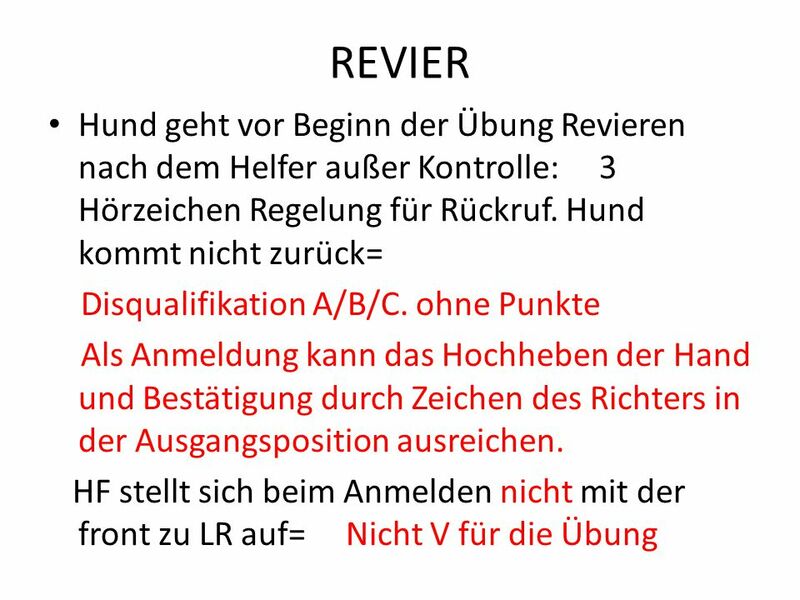 IPO III: If the dog leaves the area before exercise 6 (Retrieve over the jump ) by more than 3 meters, the exercise = 0 points. 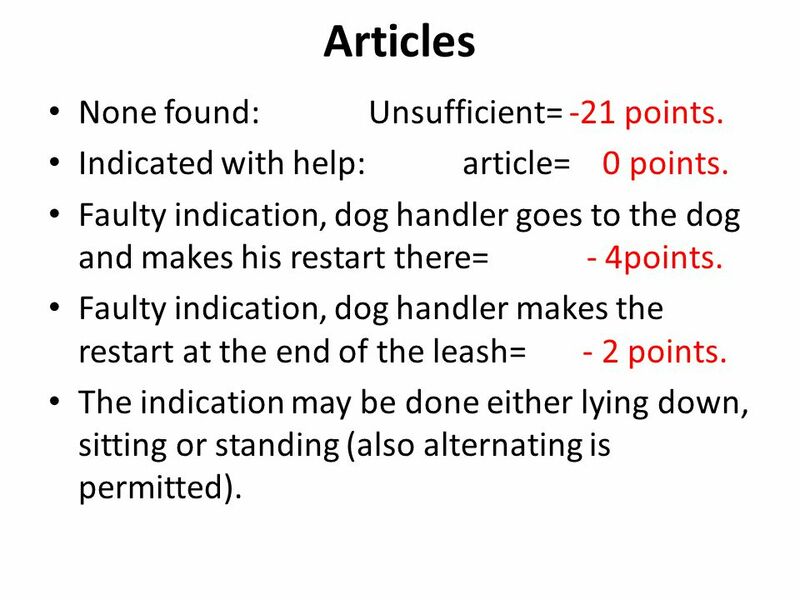 If the dog approaches the handler (HF), when the handler returns, up to 3 points can be deducted. 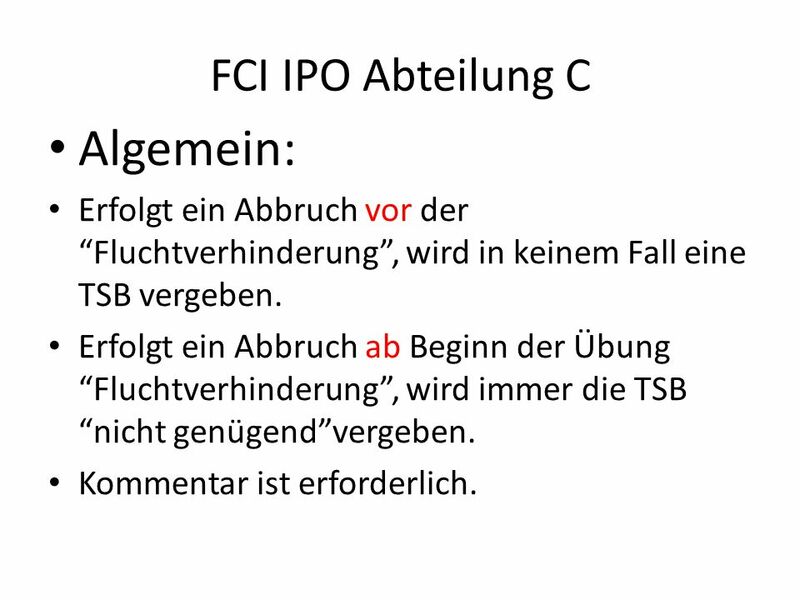 55 FCI IPO Abteilung C Algemein: Erfolgt ein Abbruch vor der “Fluchtverhinderung”, wird in keinem Fall eine TSB vergeben. Erfolgt ein Abbruch ab Beginn der Übung “Fluchtverhinderung”, wird immer die TSB “nicht genügend”vergeben. Kommentar ist erforderlich. 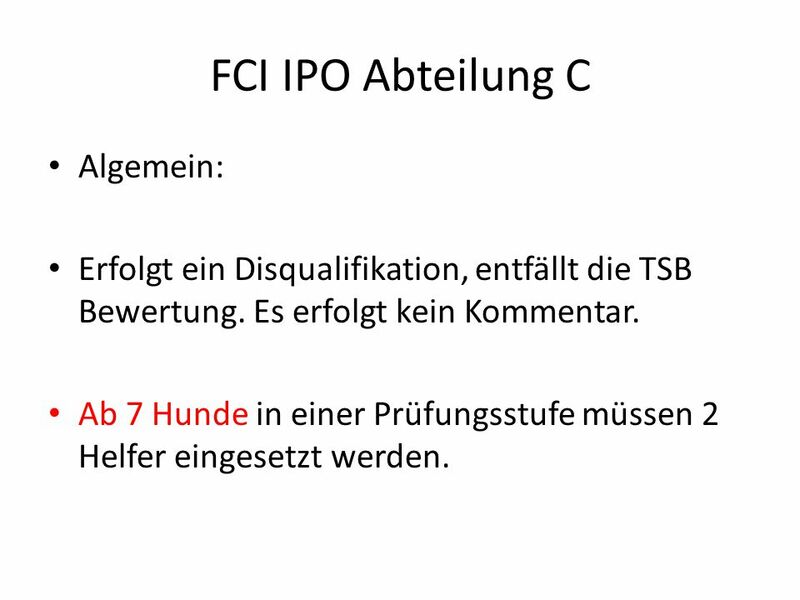 57 FCI IPO Abteilung C Algemein: Erfolgt ein Disqualifikation, entfällt die TSB Bewertung. Es erfolgt kein Kommentar. Ab 7 Hunde in einer Prüfungsstufe müssen 2 Helfer eingesetzt werden. 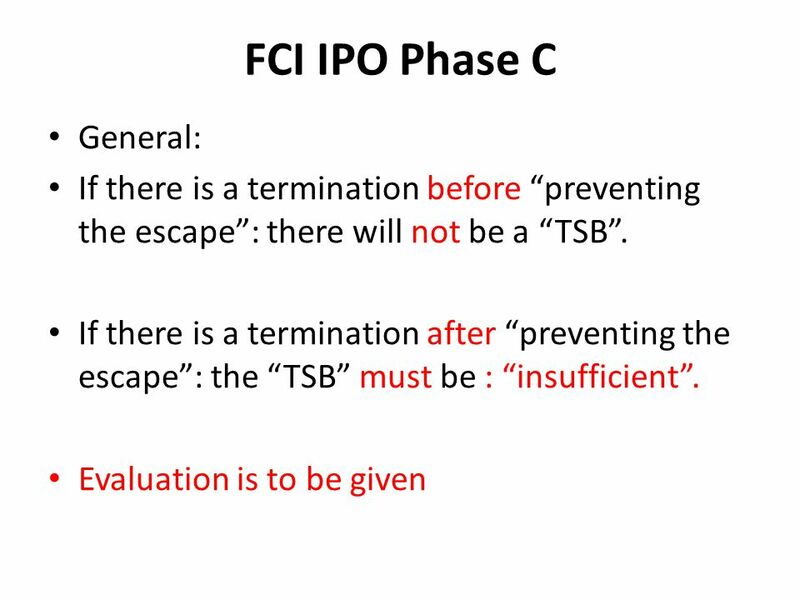 58 FCI IPO Phase C General: After a disqualification, there is NO “TSB”and NO evaluation. If more than 7 dogs are entered at the same test level, then an additional helper is required. 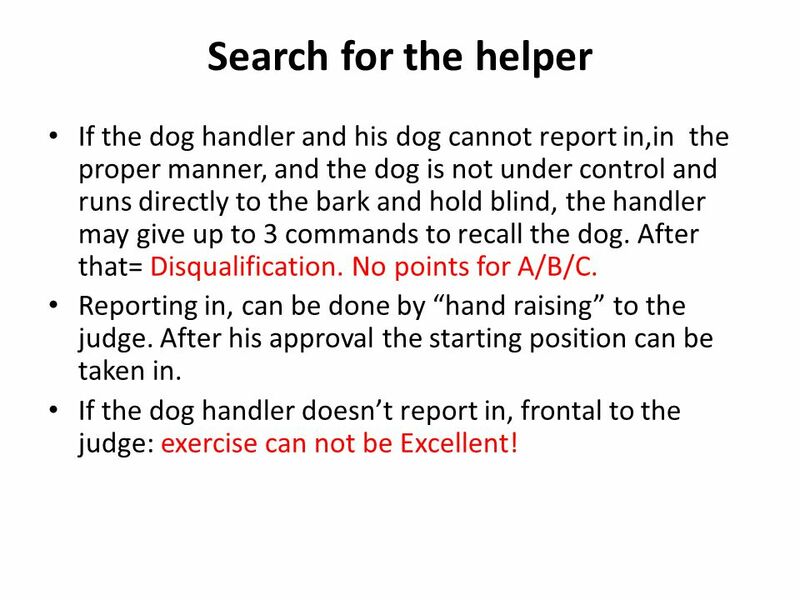 60 Search for the helper If the dog handler and his dog cannot report in,in the proper manner, and the dog is not under control and runs directly to the bark and hold blind, the handler may give up to 3 commands to recall the dog. After that= Disqualification. No points for A/B/C. Reporting in, can be done by “hand raising” to the judge. After his approval the starting position can be taken in. If the dog handler doesn’t report in, frontal to the judge: exercise can not be Excellent! 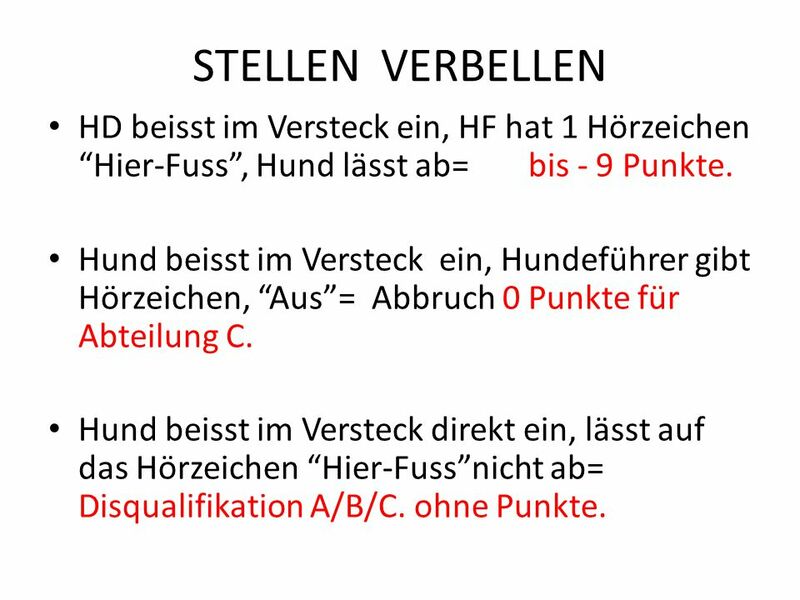 63 STELLEN VERBELLEN HD beisst im Versteck ein, HF hat 1 Hörzeichen “Hier-Fuss”, Hund lässt ab= bis - 9 Punkte. Hund beisst im Versteck ein, Hundeführer gibt Hörzeichen, “Aus”= Abbruch 0 Punkte für Abteilung C. Hund beisst im Versteck direkt ein, lässt auf das Hörzeichen “Hier-Fuss”nicht ab= Disqualifikation A/B/C. ohne Punkte. 64 Bark & Hold If the dog, coming into the blind, grips the helper: A one -time command to “here”/”heel” is to be given. The dog comes.= up to – points 9. 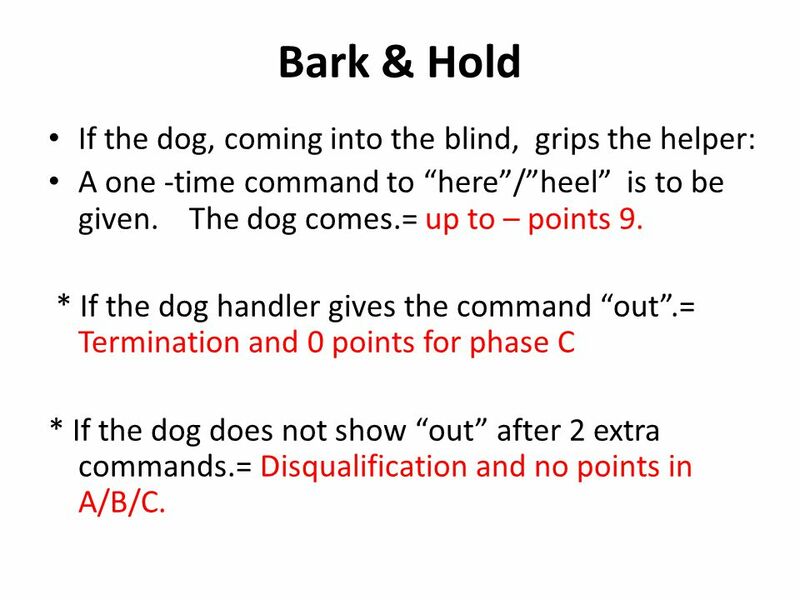 * If the dog handler gives the command “out”.= Termination and 0 points for phase C * If the dog does not show “out” after 2 extra commands.= Disqualification and no points in A/B/C. 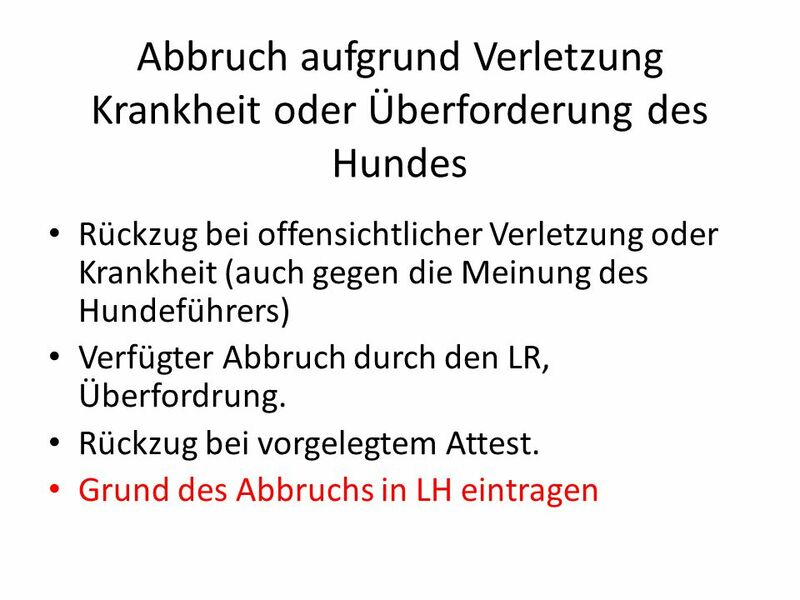 65 STELLEN VERBELLEN Hund nimmt Helfer an, verlässt diesen wieder vor der Anweisung des LR zum herantreten. Hundeführer kann den Hund noch 1x einsetzen wenn er noch kein Zeichen für das Herantreten vom Richter bekommen hat. -9 Punkte und Mangelhaft auf die Übung Verlässt der Hund den Helfer noch einmal, ist die Abteilung C abzubrechen. Verlässt der Hund den Helfer nachdem der Hundeführer das Zeichen zum Herantreten erhalten hat, ist die Übung im mangelhaft zu bewerten. 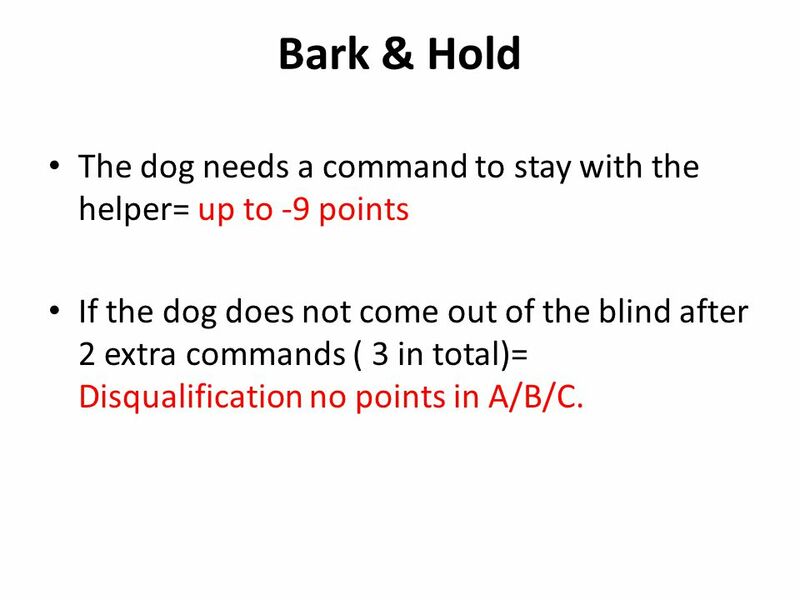 68 Bark & Hold The dog needs a command to stay with the helper= up to -9 points If the dog does not come out of the blind after 2 extra commands ( 3 in total)= Disqualification no points in A/B/C. 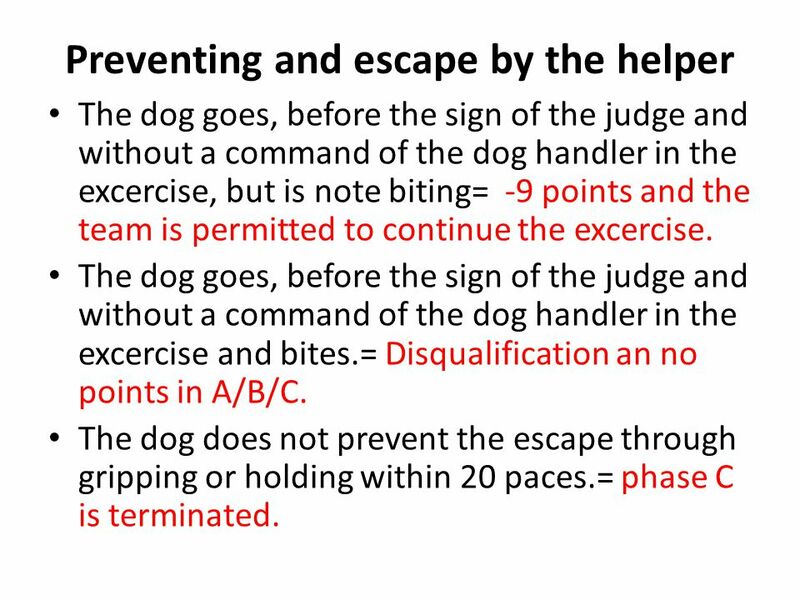 70 Preventing and escape by the helper The dog goes, before the sign of the judge and without a command of the dog handler in the excercise, but is note biting= -9 points and the team is permitted to continue the excercise. 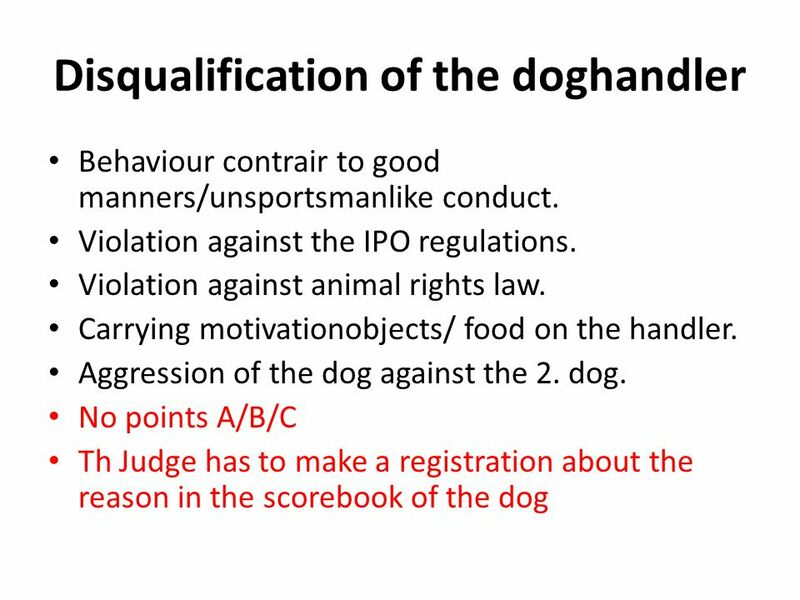 The dog goes, before the sign of the judge and without a command of the dog handler in the excercise and bites.= Disqualification an no points in A/B/C. The dog does not prevent the escape through gripping or holding within 20 paces.= phase C is terminated. 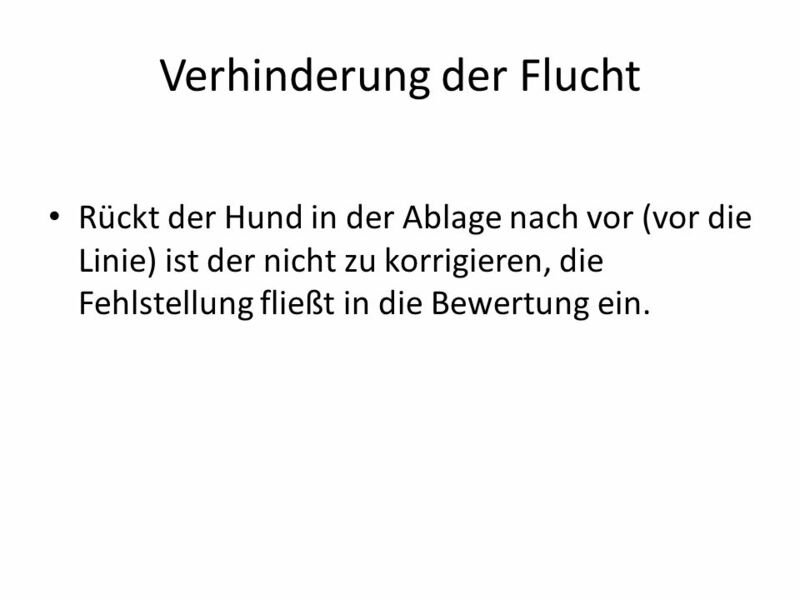 71 Verhinderung der Flucht Rückt der Hund in der Ablage nach vor (vor die Linie) ist der nicht zu korrigieren, die Fehlstellung fließt in die Bewertung ein. 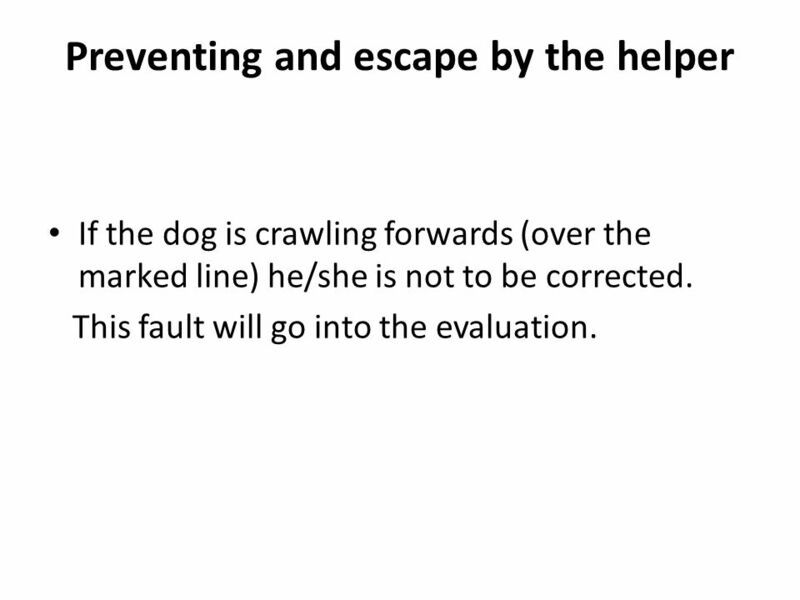 72 Preventing and escape by the helper If the dog is crawling forwards (over the marked line) he/she is not to be corrected. This fault will go into the evaluation. 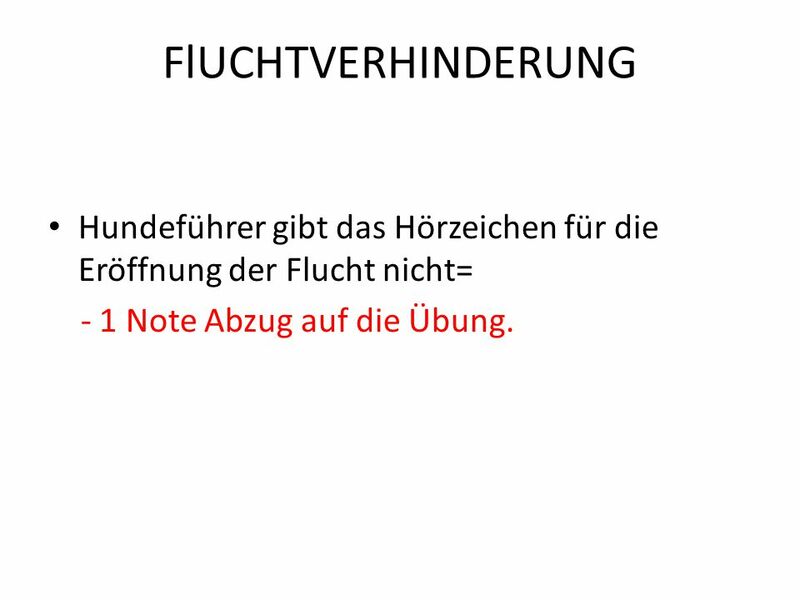 73 FlUCHTVERHINDERUNG Hundeführer gibt das Hörzeichen für die Eröffnung der Flucht nicht= - 1 Note Abzug auf die Übung. 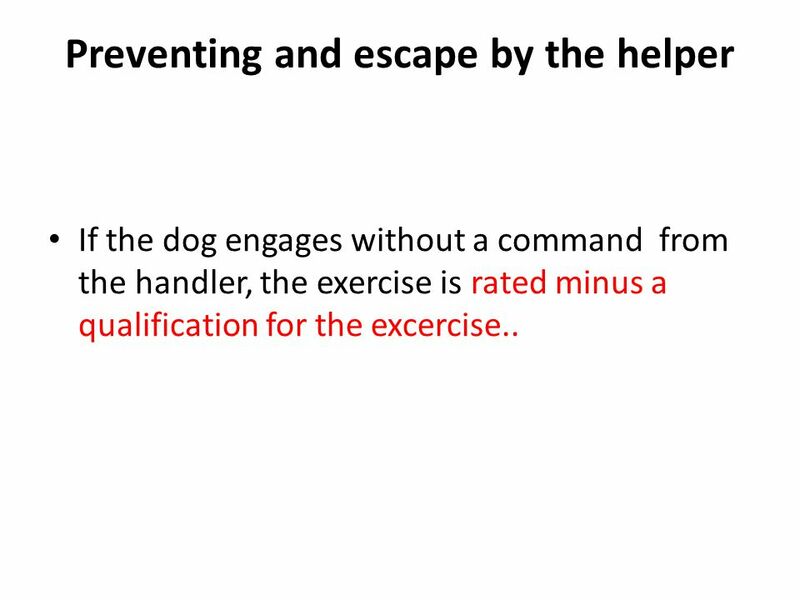 74 Preventing and escape by the helper If the dog engages without a command from the handler, the exercise is rated minus a qualification for the excercise..
75 Angriffe aus den Bewachungsphasen Siehe Prüfungsordnung Beurteilungskriterien: Wie wird der Angriff vereitelt? Wie ist das Griffverhalten in der Belastung? Wie ist der Übergang? Wie trennt der Hund? Wie bewacht der Hund? Die Hörzeichen zum Ablassen sind in der Prüfungsordnung genau beschrieben. 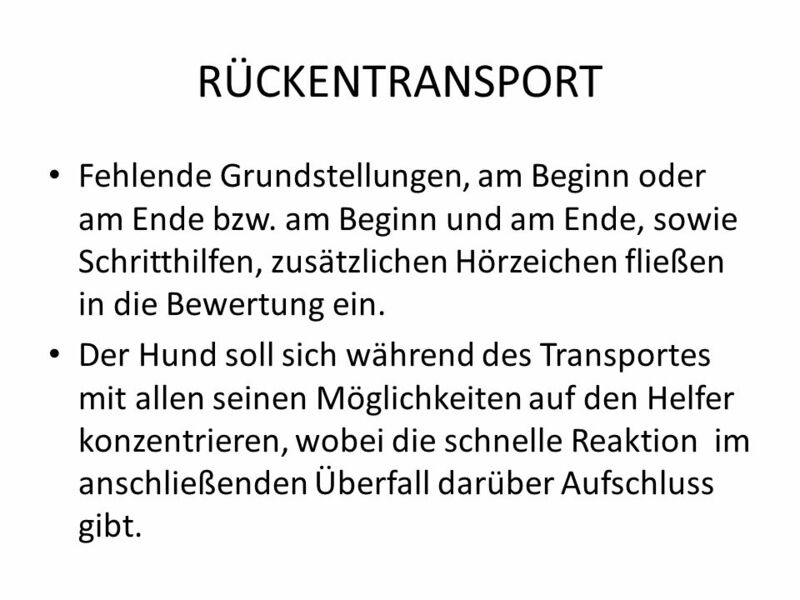 77 RÜCKENTRANSPORT Fehlende Grundstellungen, am Beginn oder am Ende bzw. am Beginn und am Ende, sowie Schritthilfen, zusätzlichen Hörzeichen fließen in die Bewertung ein. Der Hund soll sich während des Transportes mit allen seinen Möglichkeiten auf den Helfer konzentrieren, wobei die schnelle Reaktion im anschließenden Überfall darüber Aufschluss gibt. 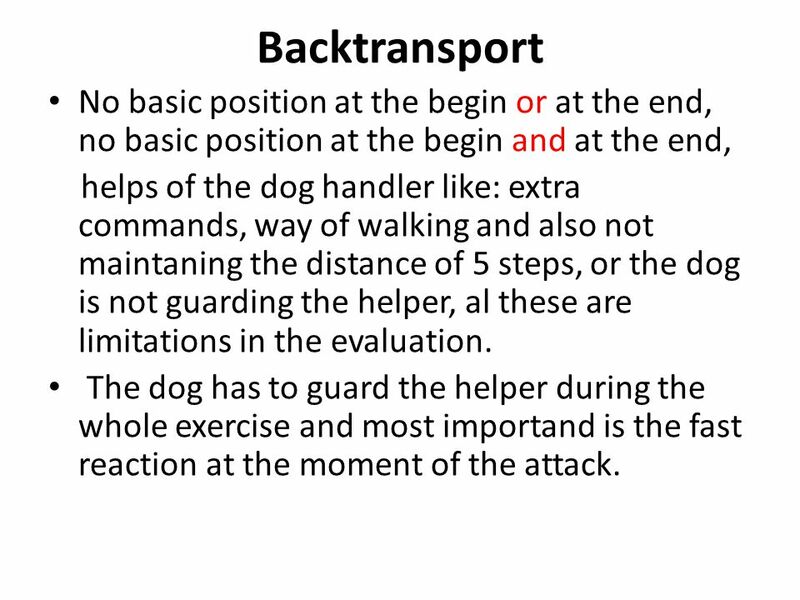 78 Backtransport No basic position at the begin or at the end, no basic position at the begin and at the end, helps of the dog handler like: extra commands, way of walking and also not maintaning the distance of 5 steps, or the dog is not guarding the helper, al these are limitations in the evaluation. 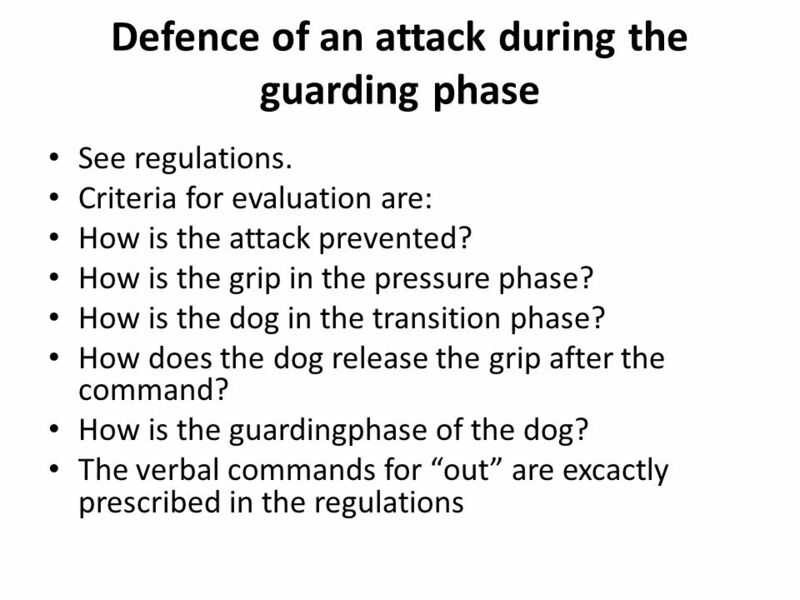 The dog has to guard the helper during the whole exercise and most importand is the fast reaction at the moment of the attack. 79 ANGRIF AUS DER BEWEGUNG Die Freifolge vom 1. 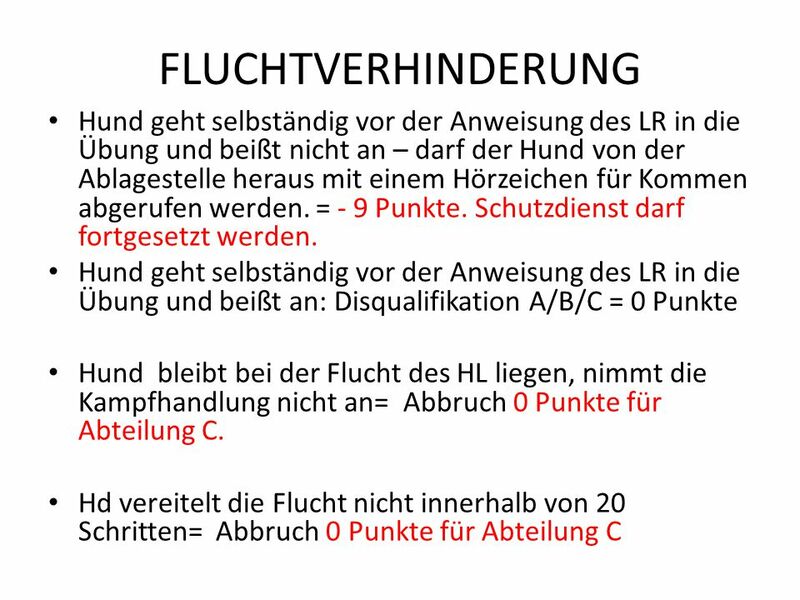 Teil zur Lauerstellung fließt in die Bewertung der Übung ein. 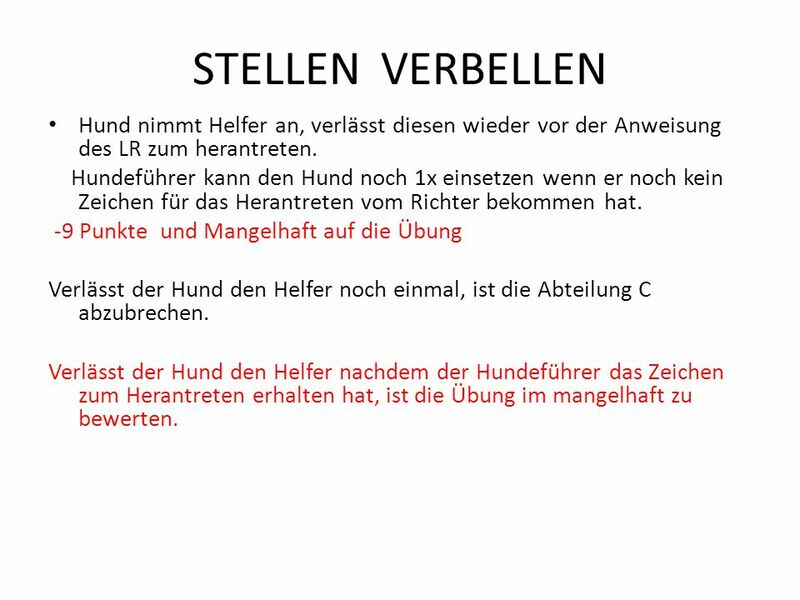 Der Hund darf erst in der korrekten Grundstellung am Halsband gehalten werden. 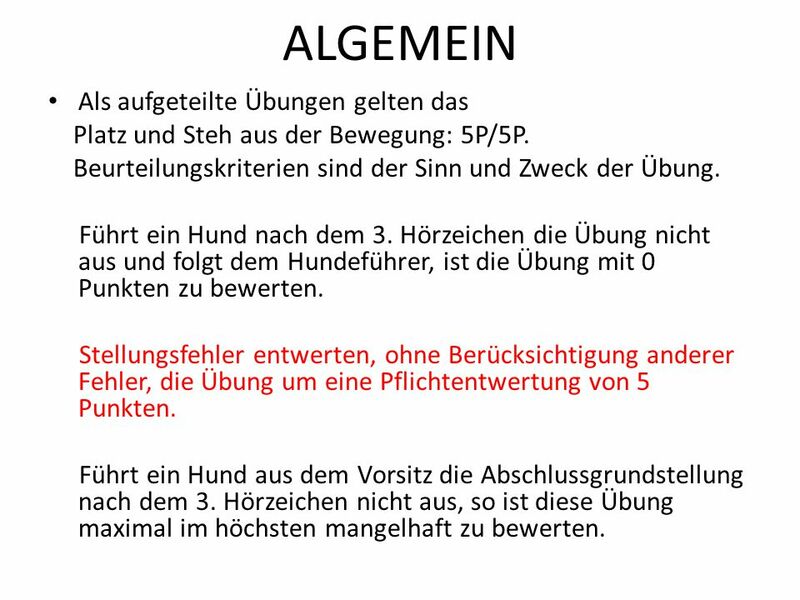 In der Lauerstellung hat sich der Hund ruhig zu verhalten, die Position beibehalten und darf nicht stimuliert werden. 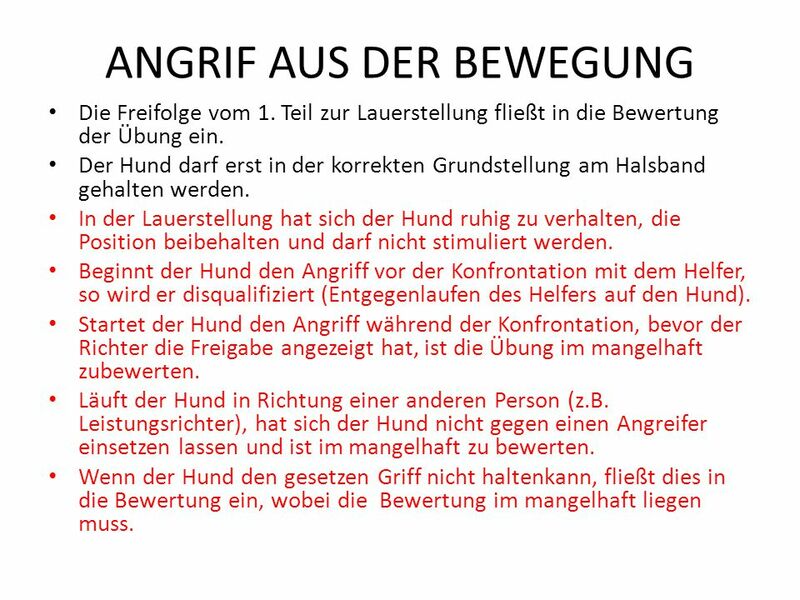 Beginnt der Hund den Angriff vor der Konfrontation mit dem Helfer, so wird er disqualifiziert (Entgegenlaufen des Helfers auf den Hund). Startet der Hund den Angriff während der Konfrontation, bevor der Richter die Freigabe angezeigt hat, ist die Übung im mangelhaft zubewerten. Läuft der Hund in Richtung einer anderen Person (z.B. Leistungsrichter), hat sich der Hund nicht gegen einen Angreifer einsetzen lassen und ist im mangelhaft zu bewerten. 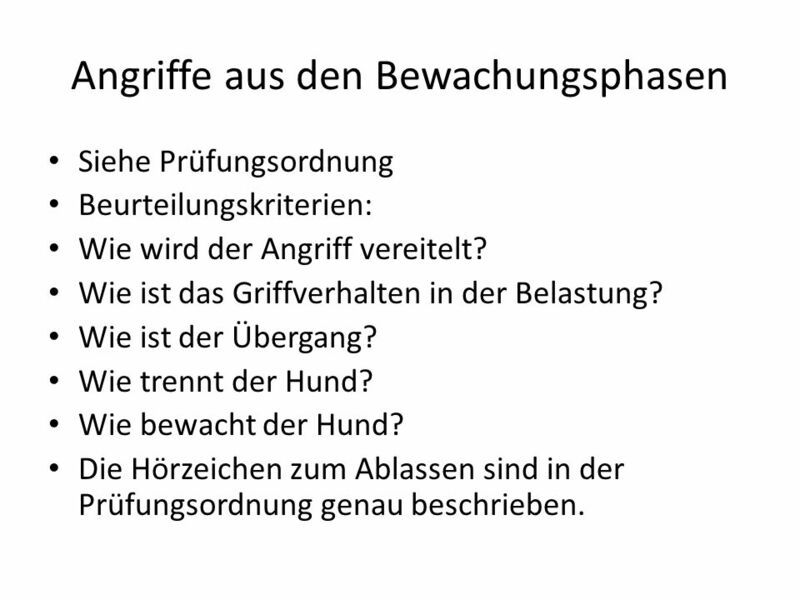 Wenn der Hund den gesetzen Griff nicht haltenkann, fließt dies in die Bewertung ein, wobei die Bewertung im mangelhaft liegen muss. 80 Attack on the dog out of motion The free heeling to the place where the exercise start will also be evaluated. The dog, sitting in the correct basic position, may be held on the collar. The straight, calm and attentively sitting dog facing the helper may however not be stimulated by the handler. 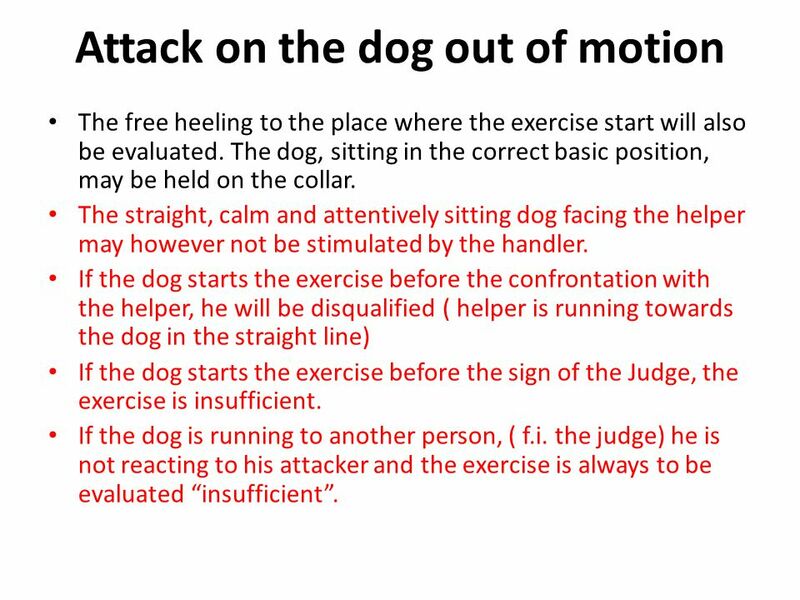 If the dog starts the exercise before the confrontation with the helper, he will be disqualified ( helper is running towards the dog in the straight line) If the dog starts the exercise before the sign of the Judge, the exercise is insufficient. If the dog is running to another person, ( f.i. the judge) he is not reacting to his attacker and the exercise is always to be evaluated “insufficient”. 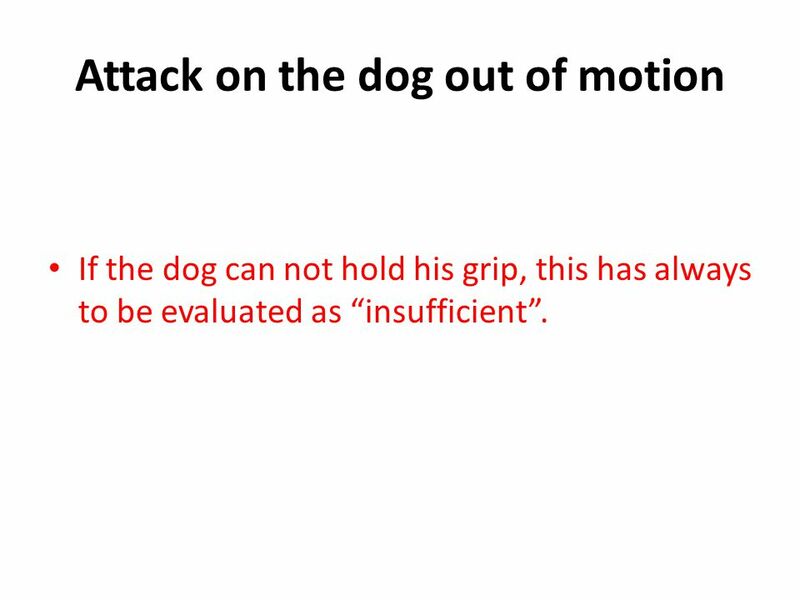 81 Attack on the dog out of motion If the dog can not hold his grip, this has always to be evaluated as “insufficient”. 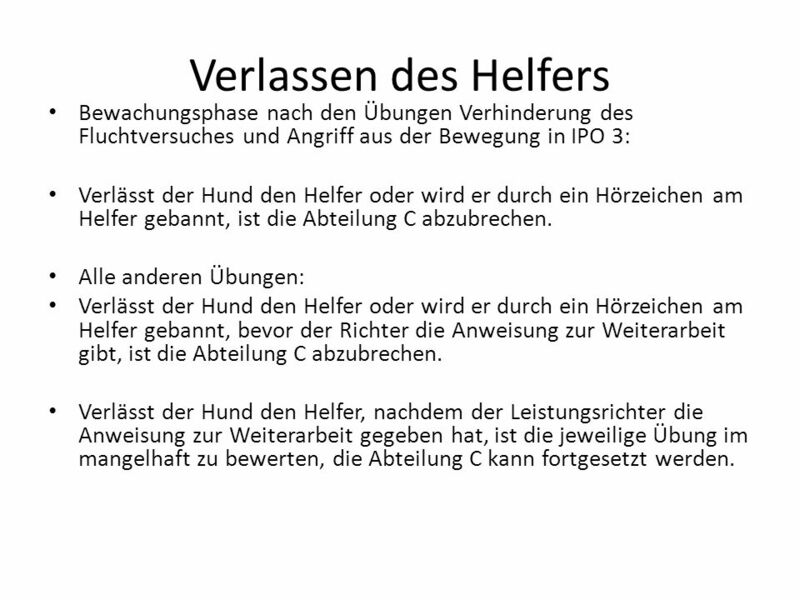 82 Verlassen des Helfers Bewachungsphase nach den Übungen Verhinderung des Fluchtversuches und Angriff aus der Bewegung in IPO 3: Verlässt der Hund den Helfer oder wird er durch ein Hörzeichen am Helfer gebannt, ist die Abteilung C abzubrechen. Alle anderen Übungen: Verlässt der Hund den Helfer oder wird er durch ein Hörzeichen am Helfer gebannt, bevor der Richter die Anweisung zur Weiterarbeit gibt, ist die Abteilung C abzubrechen. Verlässt der Hund den Helfer, nachdem der Leistungsrichter die Anweisung zur Weiterarbeit gegeben hat, ist die jeweilige Übung im mangelhaft zu bewerten, die Abteilung C kann fortgesetzt werden. 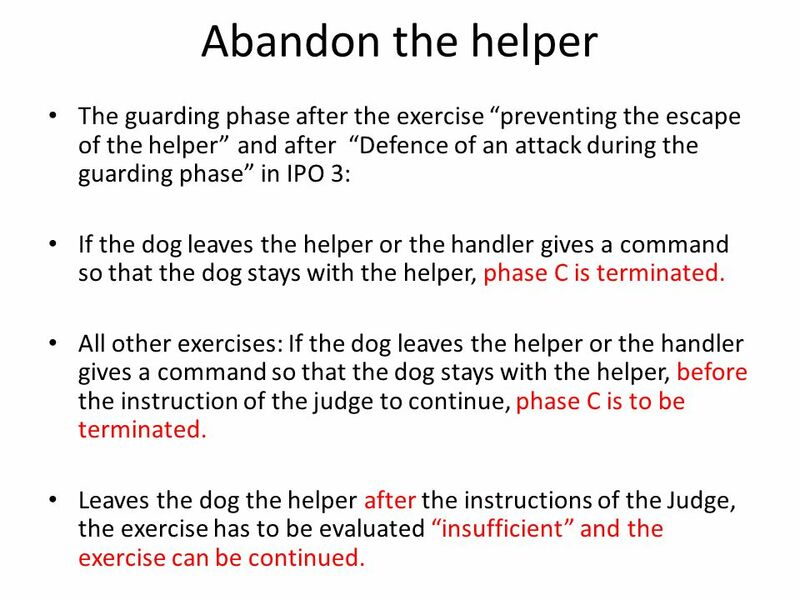 83 Abandon the helper The guarding phase after the exercise “preventing the escape of the helper” and after “Defence of an attack during the guarding phase” in IPO 3: If the dog leaves the helper or the handler gives a command so that the dog stays with the helper, phase C is terminated. 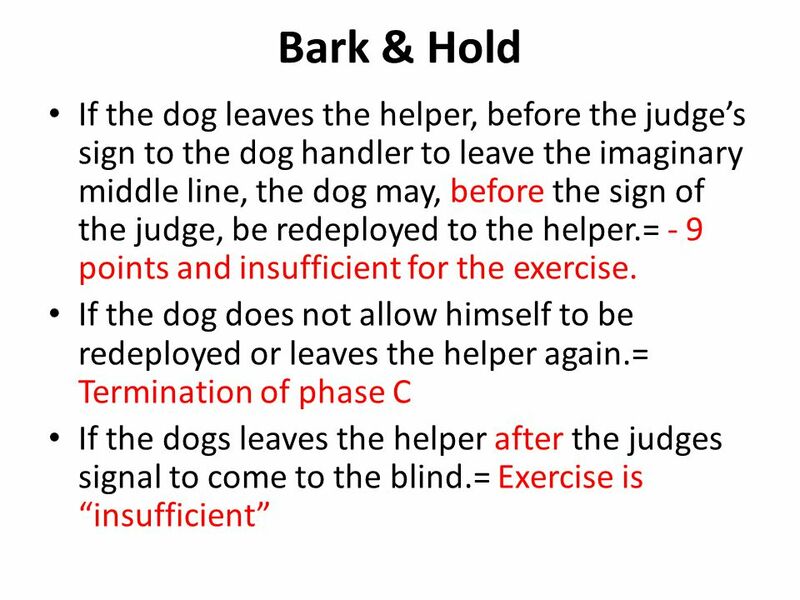 All other exercises: If the dog leaves the helper or the handler gives a command so that the dog stays with the helper, before the instruction of the judge to continue, phase C is to be terminated. Leaves the dog the helper after the instructions of the Judge, the exercise has to be evaluated “insufficient” and the exercise can be continued. 84 ABMELDEN AM ENDES DES SCHUTZDIENST Kann der Hund nach der Abmeldung beim Leistungsrichter nicht in kontrollierter Freifolge vom Helfer über eine Distanz von mindestens 5 Schritten weggeführt werden, ist der Hund zu disqualifizieren. 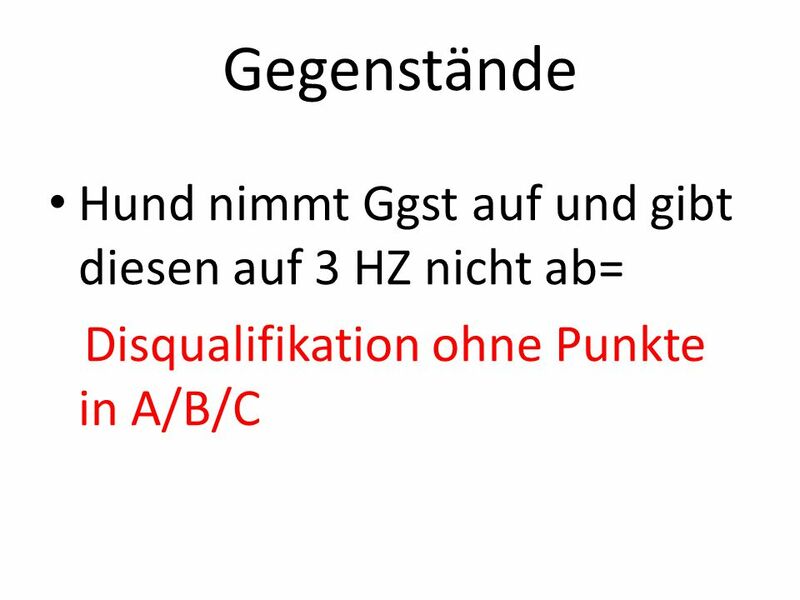 Zusätzliche Hörzeichen oder andere Hilfen fließen in die Bewertung ein. 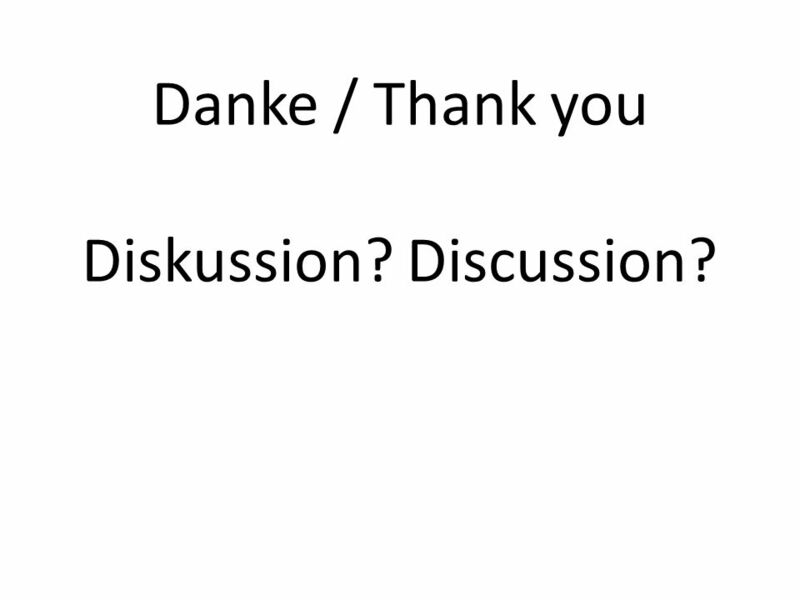 86 Danke / Thank you Diskussion? Discussion? 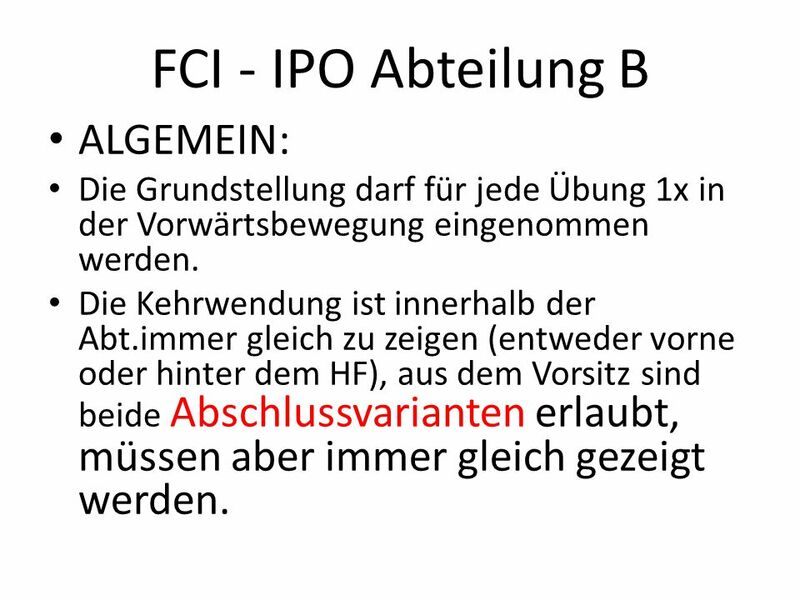 Herunterladen ppt "FCI – IPO. 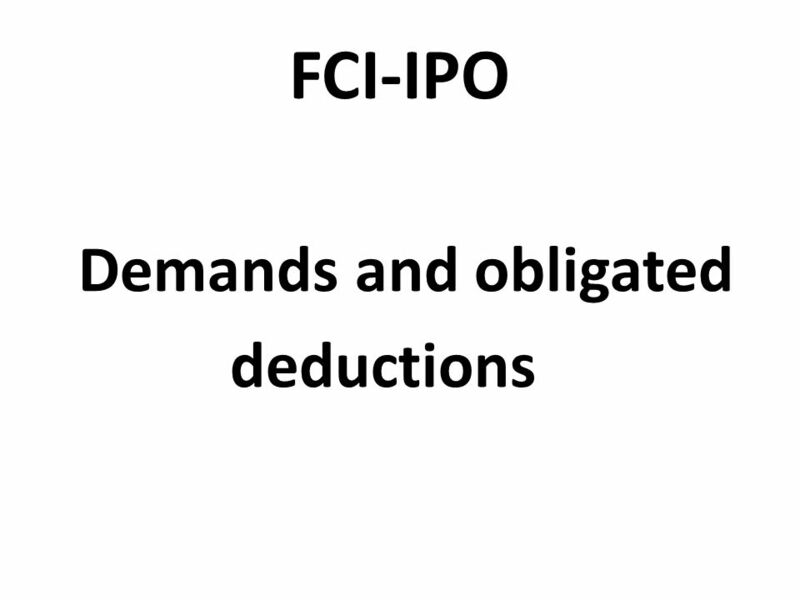 FCI-IPO Demands and obligated deductions." EITHER / OR PREPOSITIONS These are prepositions than may be used either with dative or accusative depending on the context AN AUF IN HINTER NEBEN. FCI-Richtertagung Nova Gorica 19. Und 20. Jänner 2013. 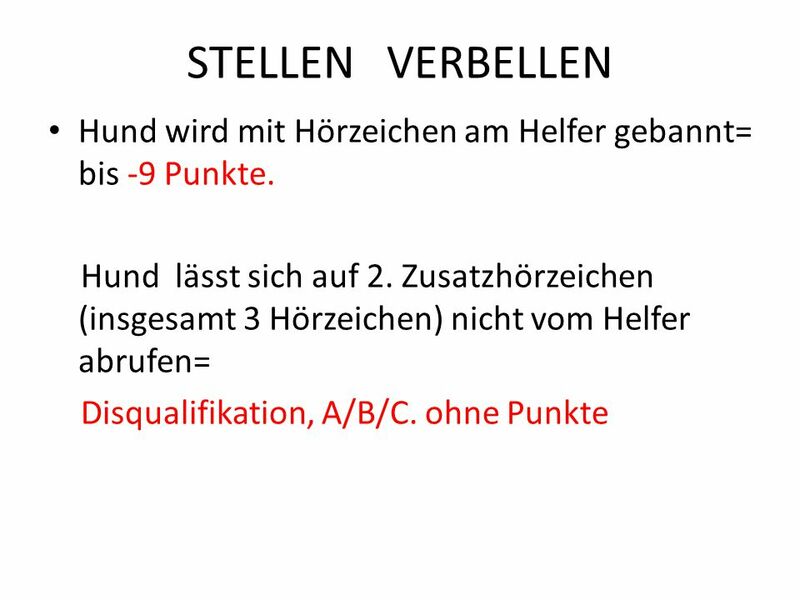 GERMAN WORD ORDER ORDER s. Sentences are made up by placing a variety of words in a specific order. If the order is wrong, the sentence is difficult to.